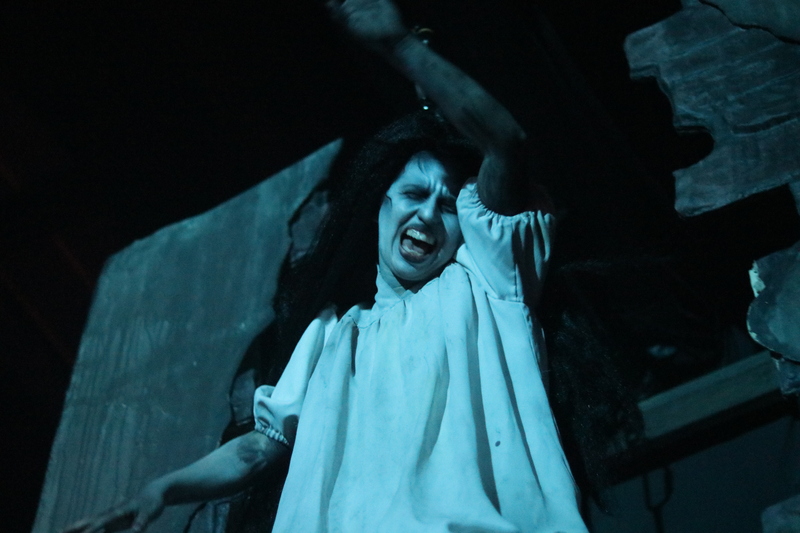 Knott’s Scary Farm (or Halloween Haunt as many fans know it) has been scaring and emotionally scarring guests for the better part of 45 years! Over those years, the event has seen its fair share of changes and has evolved since its more humble beginnings. Nothing makes this more apparent than the 2017 season, which to us is probably the STRONGEST year Knott’s has ever produced. 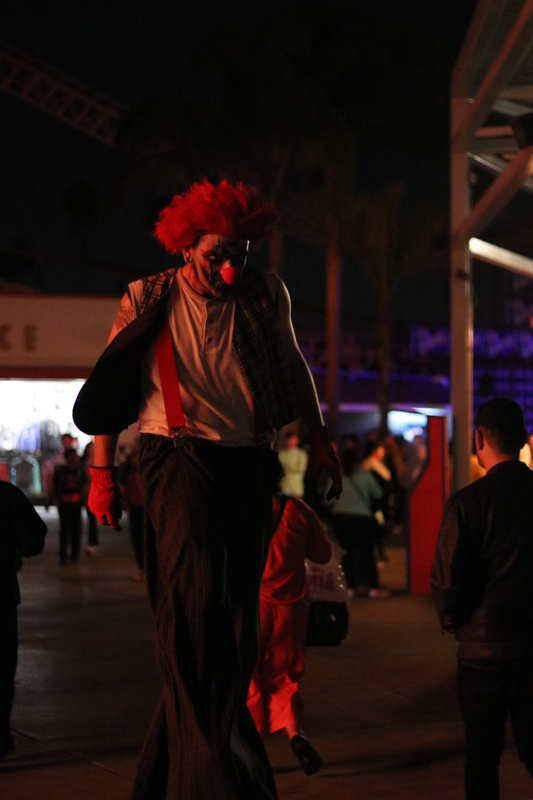 Boasting 9 Mazes, 4 Scare Zones, 2 Massive Shows, and plenty of rides; Knott’s Scary Farm seems to have an eclectic assortment of attractions for all types of haunt fans! 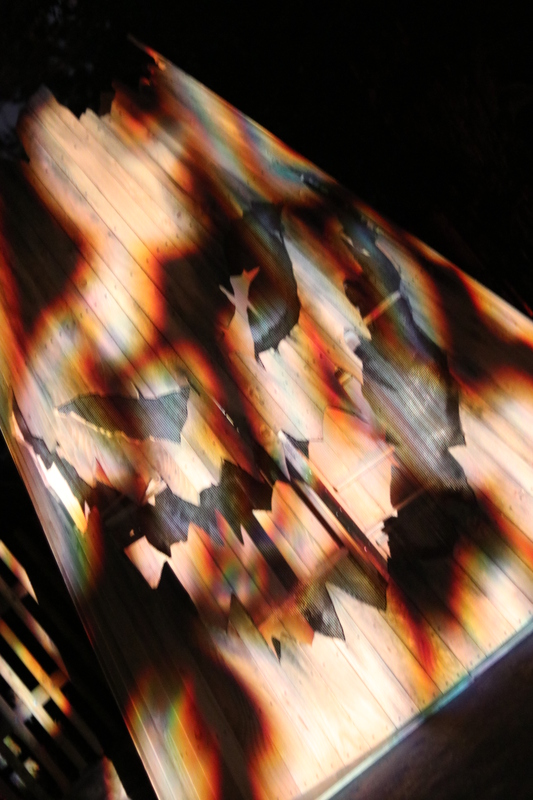 This years offerings range from the fun and spooky Timber Mountain Log Ride: Halloween Hootenanny, to the unbelievably unnerving Paranormal Incorporated. 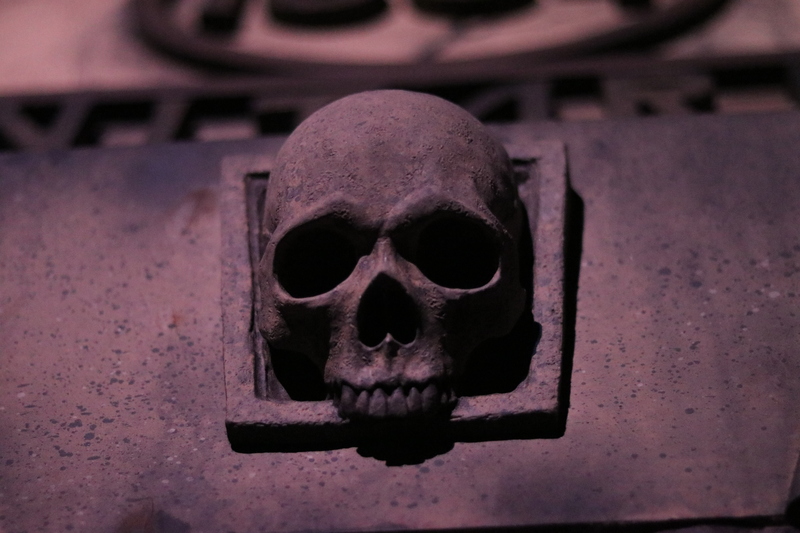 What follows is our thoughts on the mazes and scare zones themselves. We will give an event wide review soon coming up on our Podcast! The place that started it all, Ghost Town! 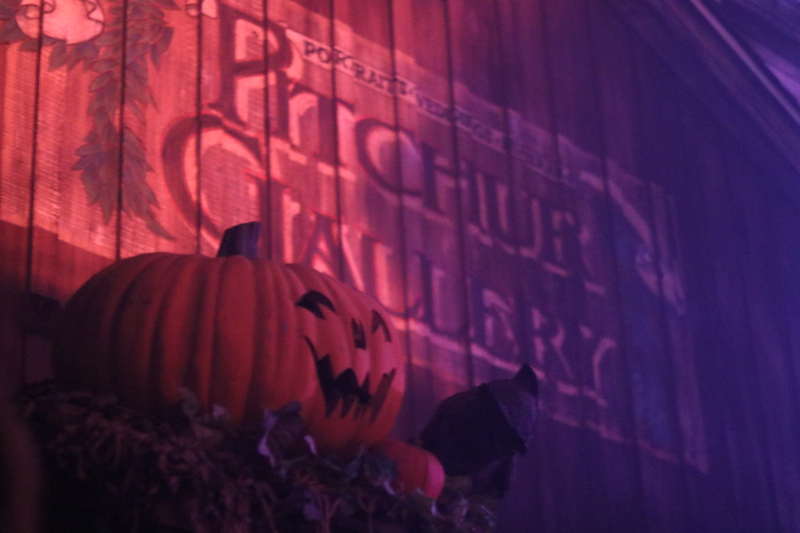 In our opinion, the most iconic and unnerving of the scare zones. 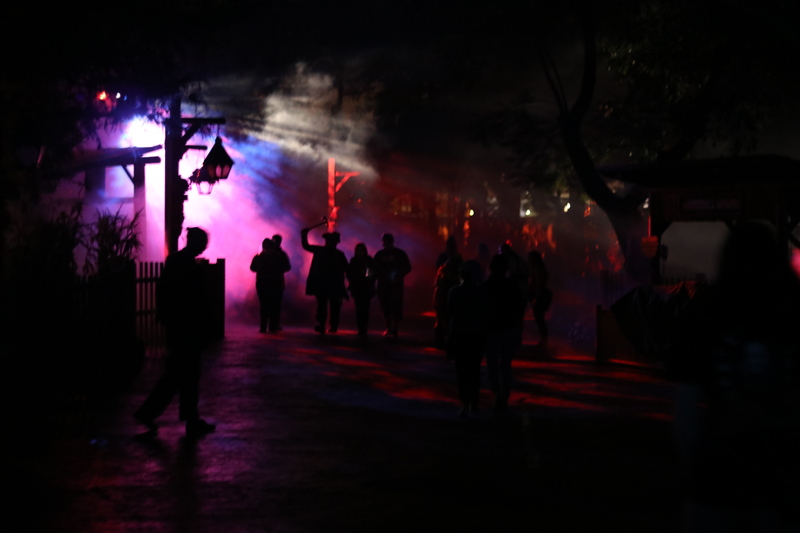 Ghost Town Streets exudes everything that Scary Farm is to us fans: fog, incredible lighting, immersive setting and a sense of dread. 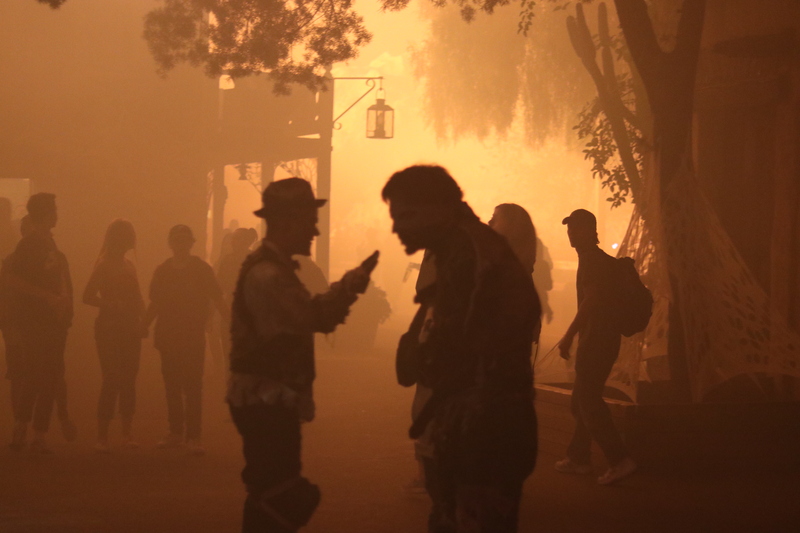 Walking into a thick cloud of fog while trying to venture to the other side is the perfect opportunity for some of the best scare actors in the business to get you when you least expect it! 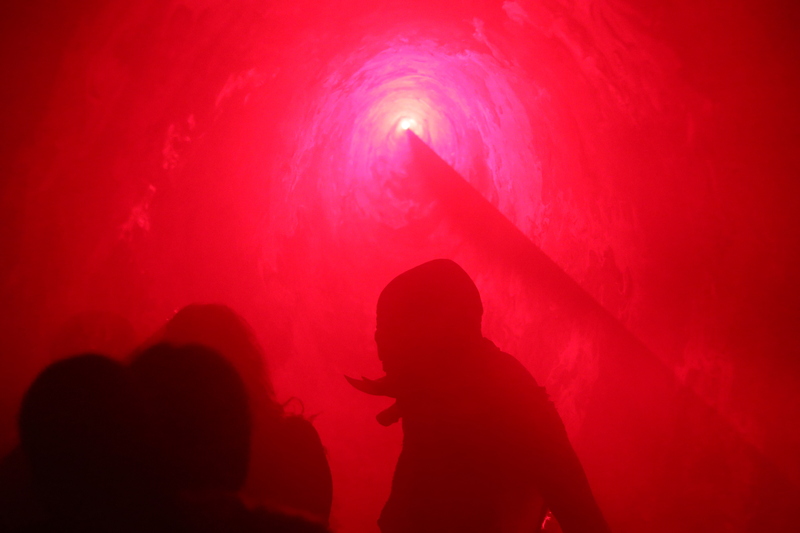 This scare zone is guaranteed to get you every single time you decide to venture into that fog. 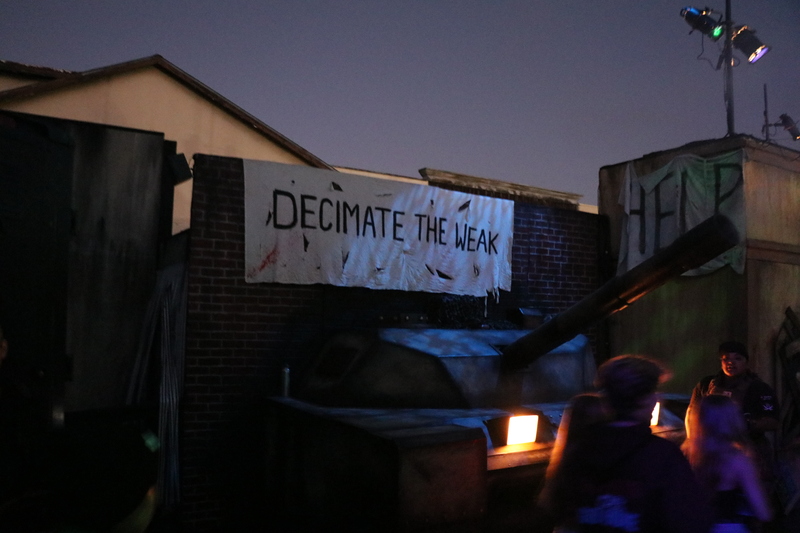 The lighting in the scare zone is top notch and really sets a tone for the entire event. Surprisingly, this was probably one of my favorite things I found in Ghost Town this year! 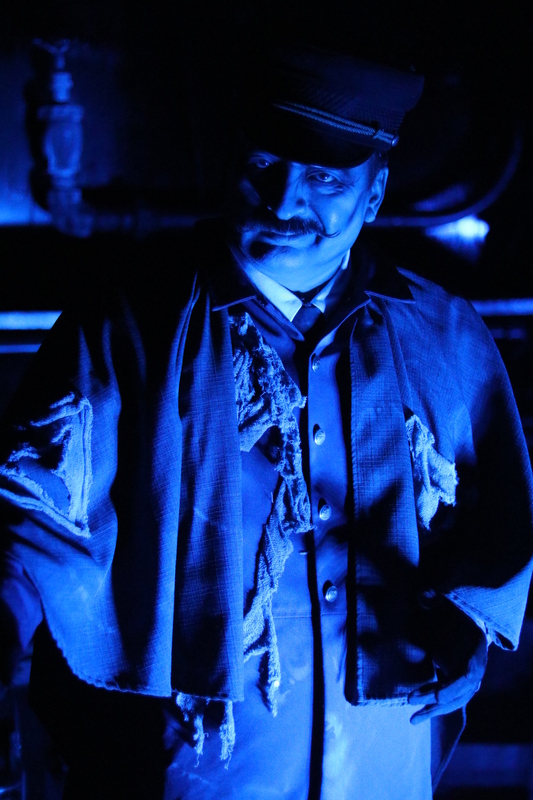 A eerie Train Conductor standing guard by his ghostly train. It’s these small touches that I love to see at the event that make it so special. The character isn’t meant to scare you (although he might), he is more or less there to set a tone and put you on edge. Makes for much easier scaring for the other monsters! On top of that, it is just amazing to see a wide range of street talent that all have different purposes! 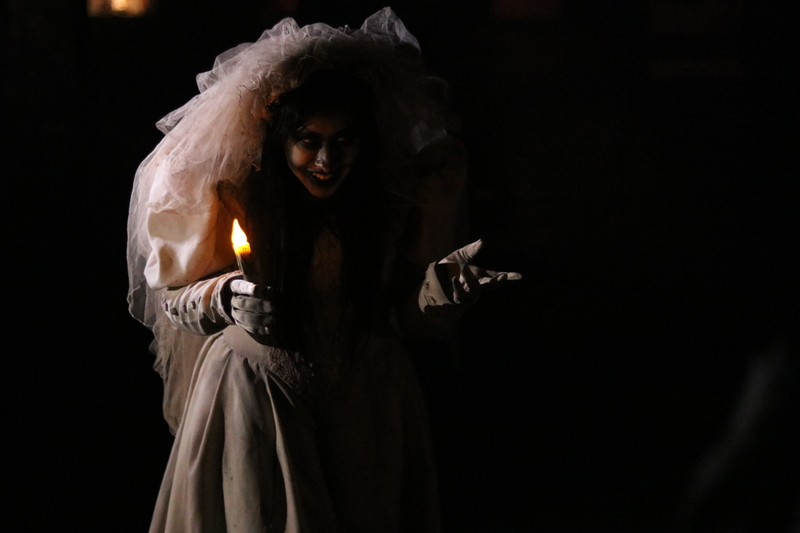 The Ghost Town Streets Bride beckons guests as they enter Ghost Town. 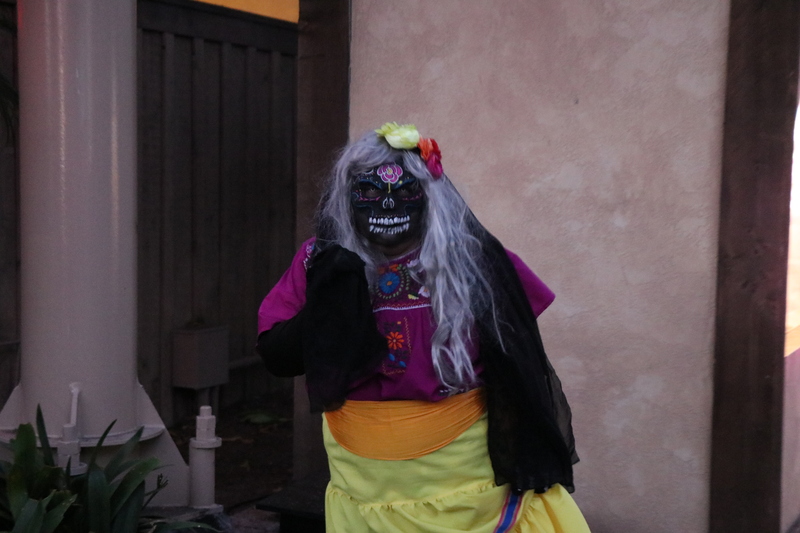 Be warned, she is no Bride to be, but a Bride out to get you and your soul. One major inclusion this year is the incorporation of Sad Eye Joe! But he has become a rather perturbed character at night and has taken on the name Mad Eye Joe! 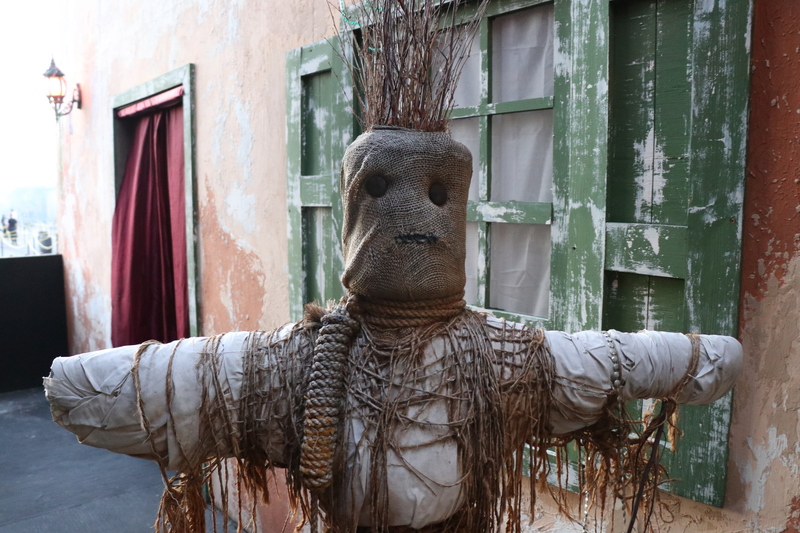 Instead of the normal jibber jabber you get from the character during the day, you are met with a rude, angry and hysterical version of our favorite Ghost Town resident! Once again, it’s those small things that really set this place apart. 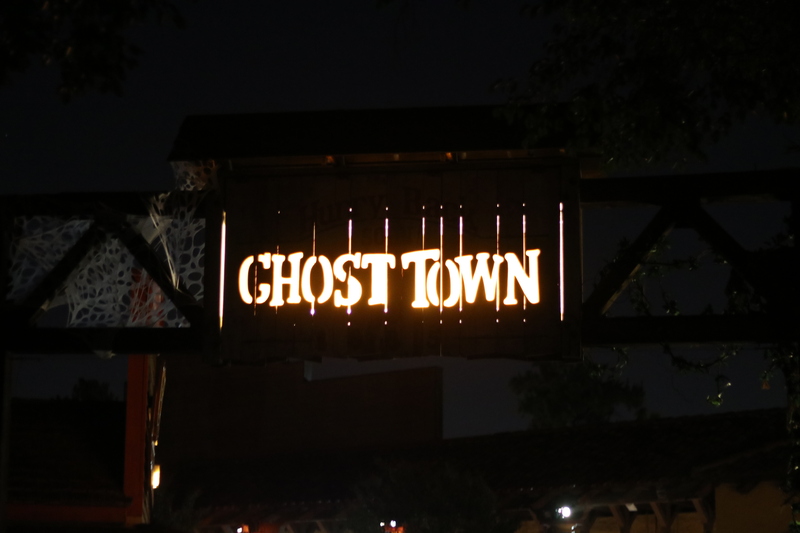 Overall, Ghost Town is the scare zone to beat for any and all haunted events. It is the cream of the crop and it only continues to get better year after year! 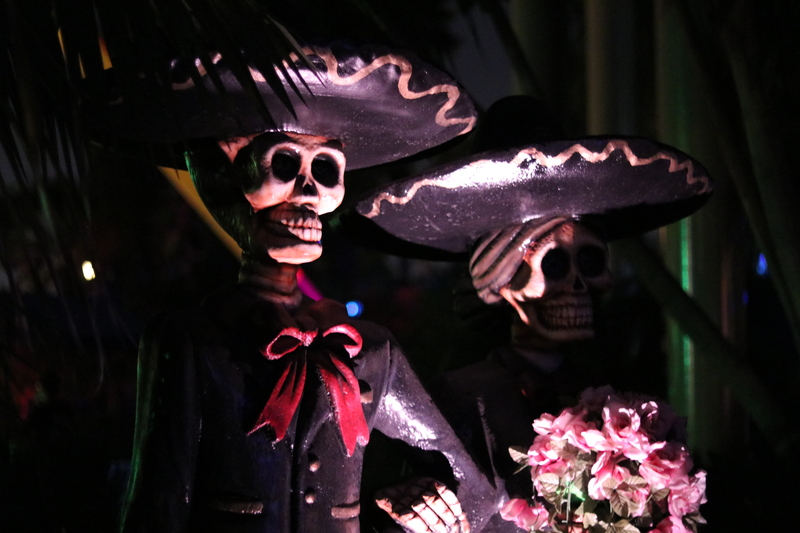 Fiesta de los Muertos fuses Latin American mythology, colorful costumes, and larger than life stilt walkers to create a terrifying trail filled with legendary monsters from hundreds of years of folklore waiting for you in the shadows. 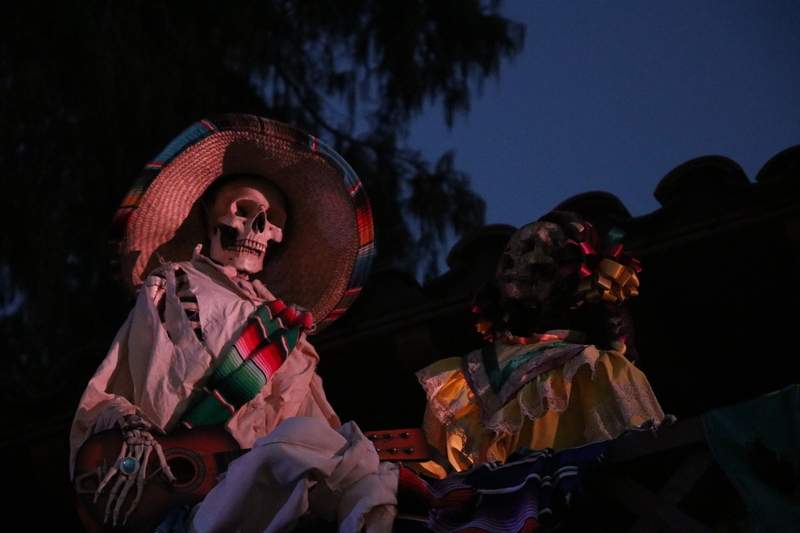 Just like Ghost Town, Fiesta De Los Muertos (FDLM) is situated in the perfect area of the park that fits the theme, Fiesta Village. 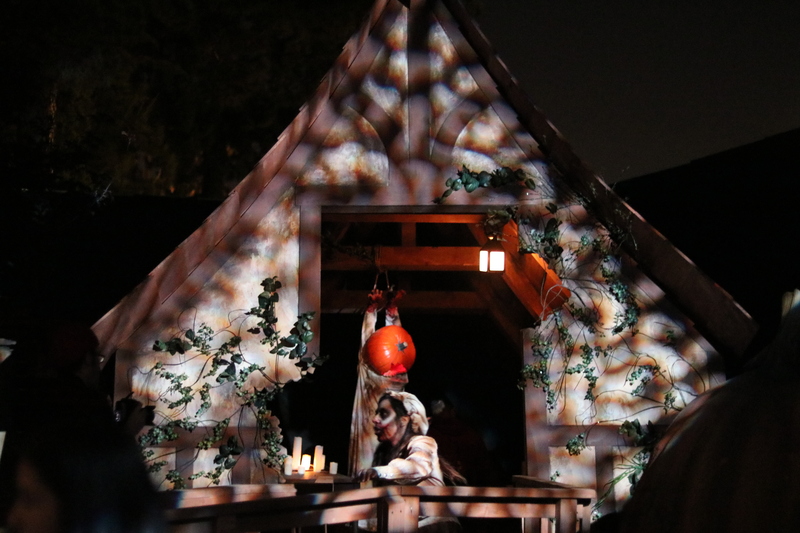 Knott’s really doesn’t have to do too much for this scare zone given it’s location. But it is nice to see some stuff spread around the area. 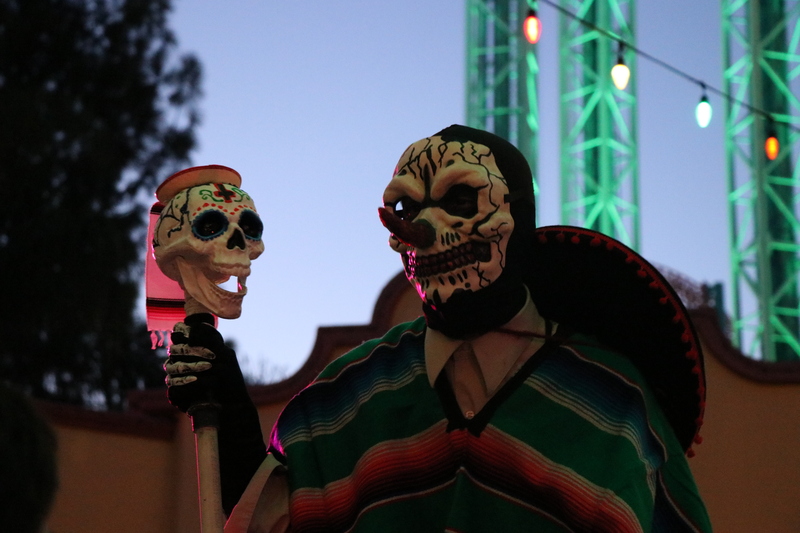 Early on, it was stated that FDLM would no longer be the party portion of the park and would become a true scare zone. This meant new music, new lighting package and much more. We noticed the lack of thumping music but no new lighting package. 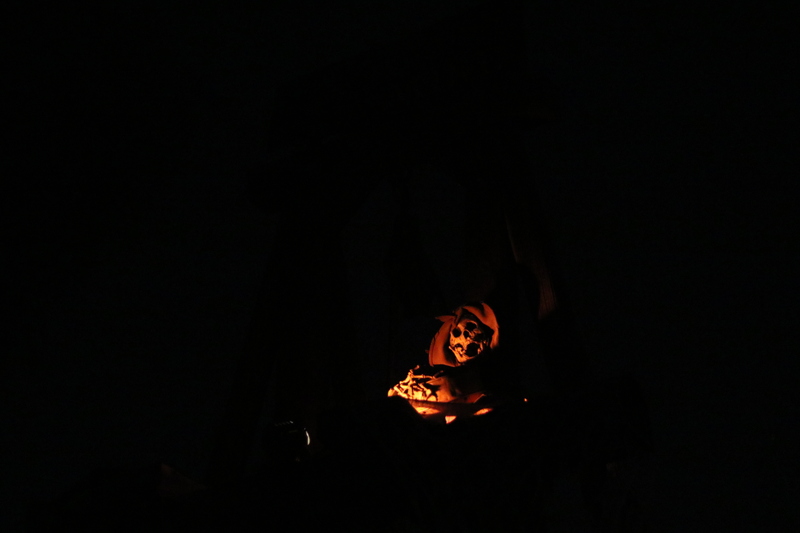 It could have easily been lost on us, but man is this scare zone still effective! 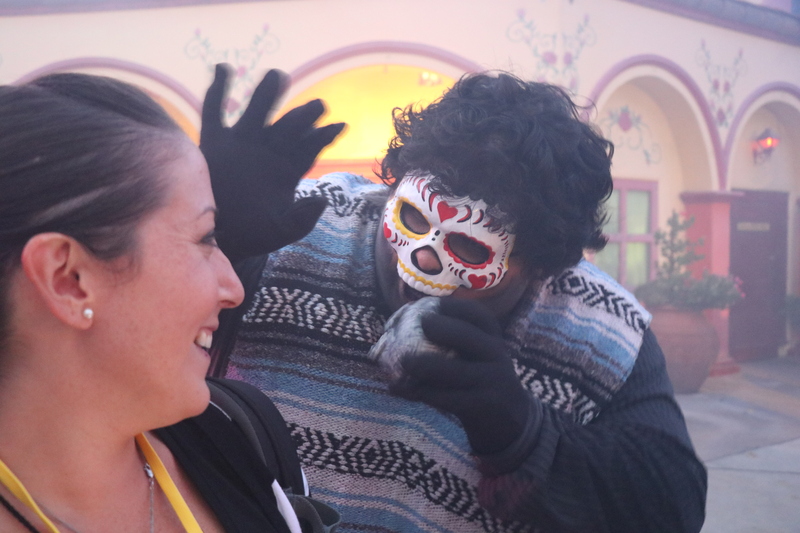 The area felt pretty dark and it’s very difficult to differentiate whether the thing in front of you is a monster or another guest, but everything becomes much clearer when you see the person is wearing an oversize sombrero. 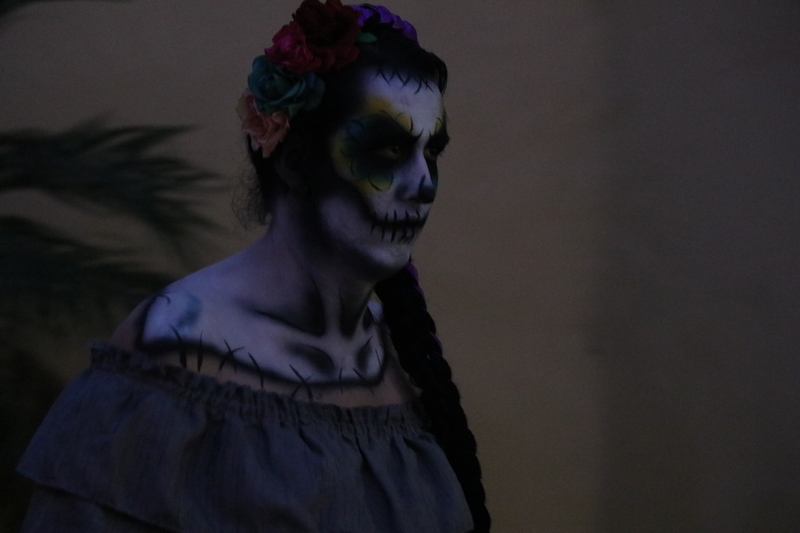 One thing we would love to see happen in FDLM is less masks and more air brush make up overall. The masks are fine, but when you have too many of them it becomes a bit less unique. 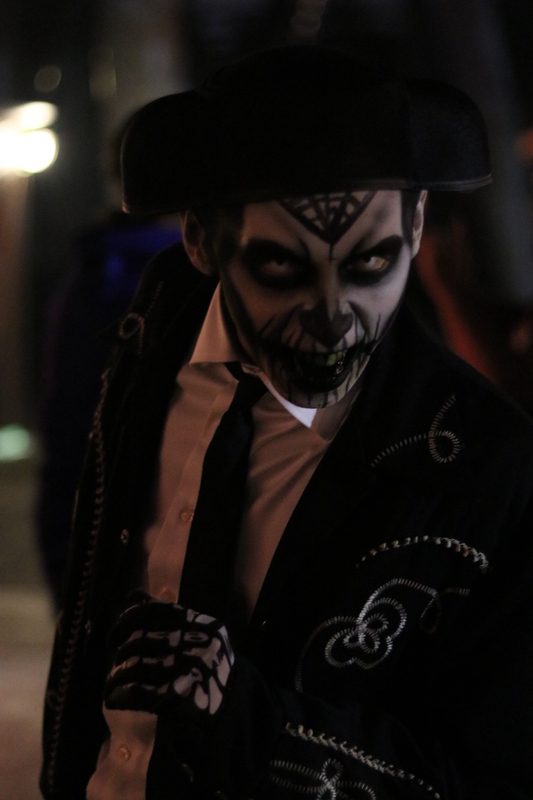 The few people we saw that had air brush make up really stood out and were actually much more scary than those wearing masks. 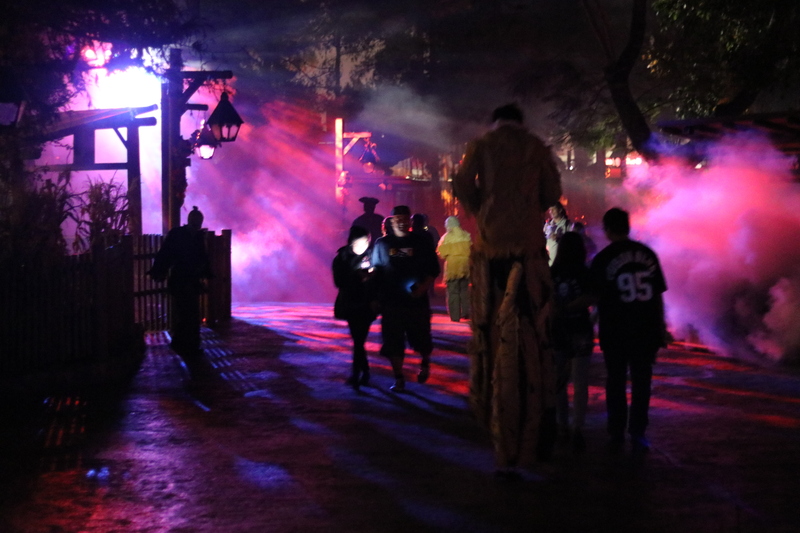 Absolutely love the stilt walkers in this scare zone. You can’t tell but the photo below is of a stilt walker. Just look at his head in relation to Supreme Scream! 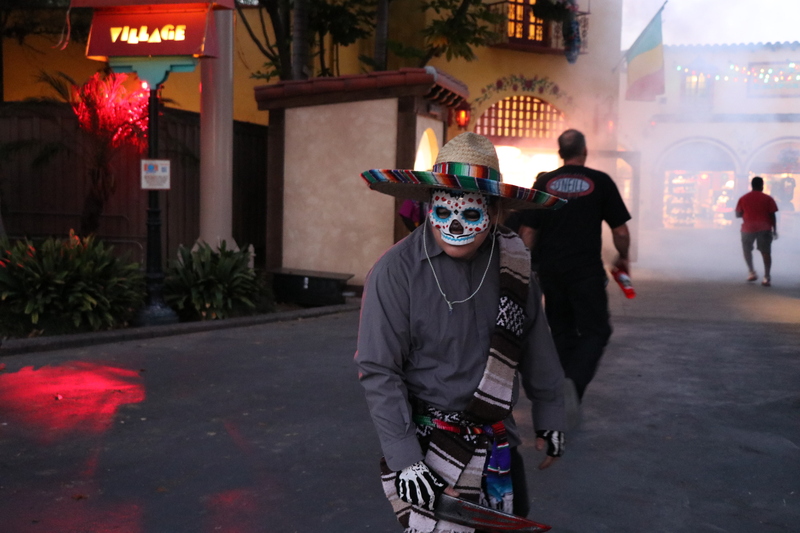 Usually when there is major construction going on in theme parks during Halloween events, scare zones suffer. 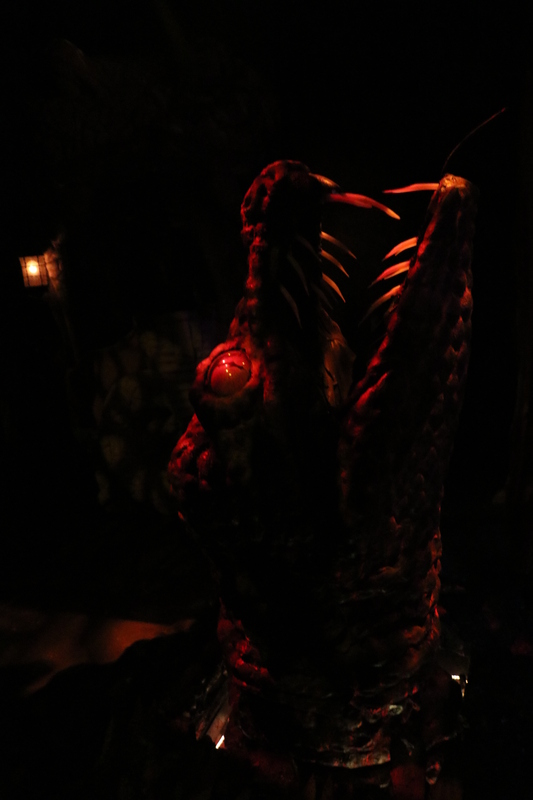 If the scare zone is strong enough, however, it can overcome this obstacle. 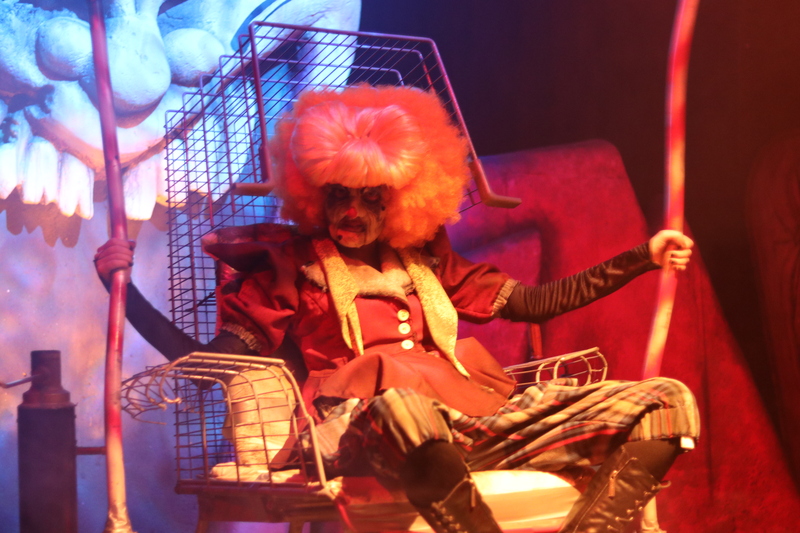 Carnevil is a prime example of exemplary talent shining through. Across from Coast Rider is a massive construction area for the new coaster: Hangtime! Because of this, the area on Boardwalk has shrunk. This created a much smaller space for the clowns which, to their benefit, made it feel much more populated than normal. 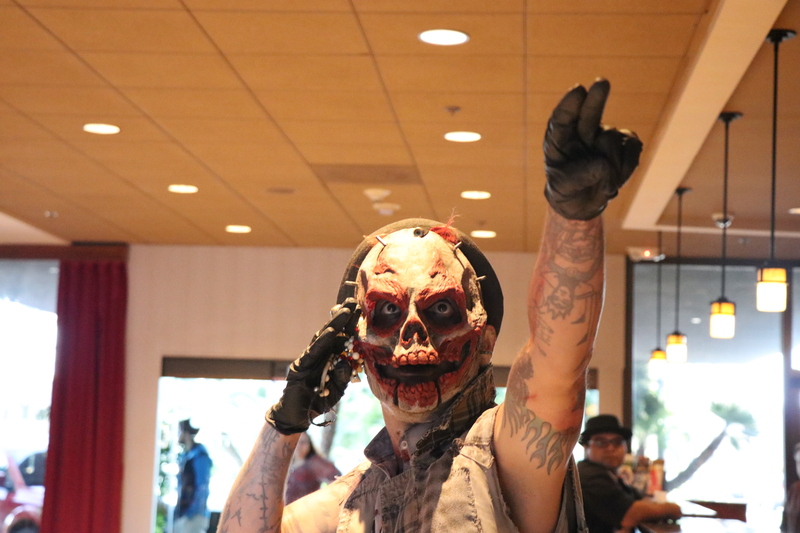 Combine that with the high energy of there performers, you have a great scare zone. 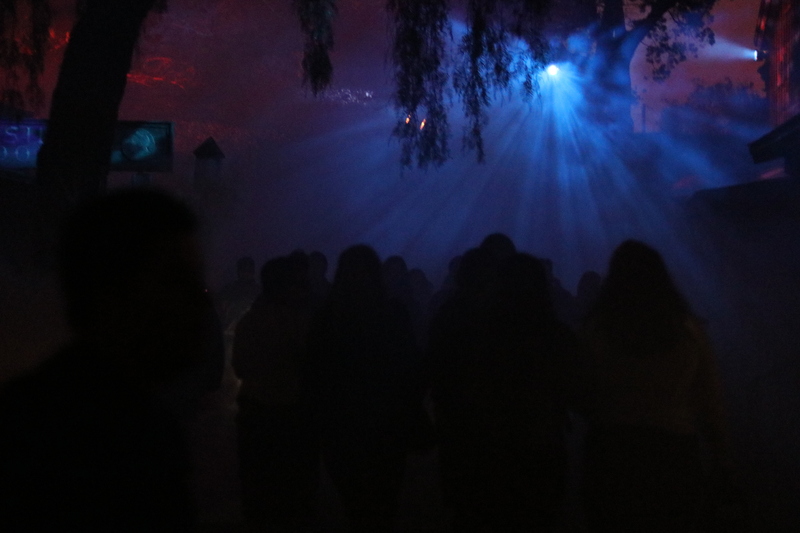 I have never seen this scare zone so active and so energetic in years! 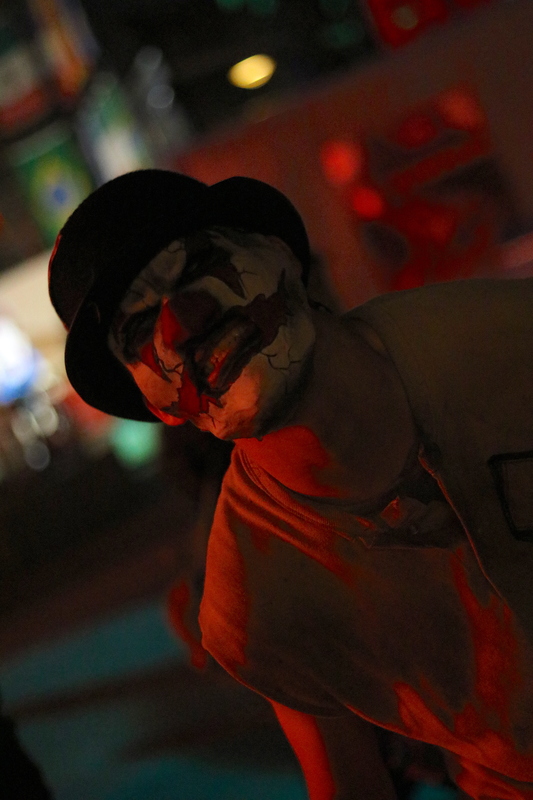 Every time we walked through we got scared, startled or just entertained by the pure craziness that is the clowns! This clown below did not have the normal jug filled with nuts and bolts! He had a very loud horn that could make anyone scream! It was awesome watching this guy do his thing. 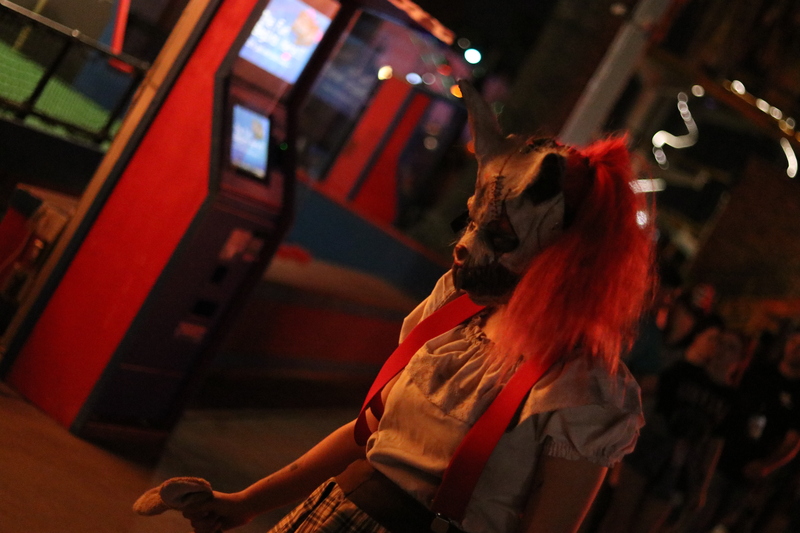 If I were to be honest, Carnevil has never been my favorite scare zone at Scary Farm. Each year I left feeling like it was the last for the zone. If anything, this year has changed my mind! 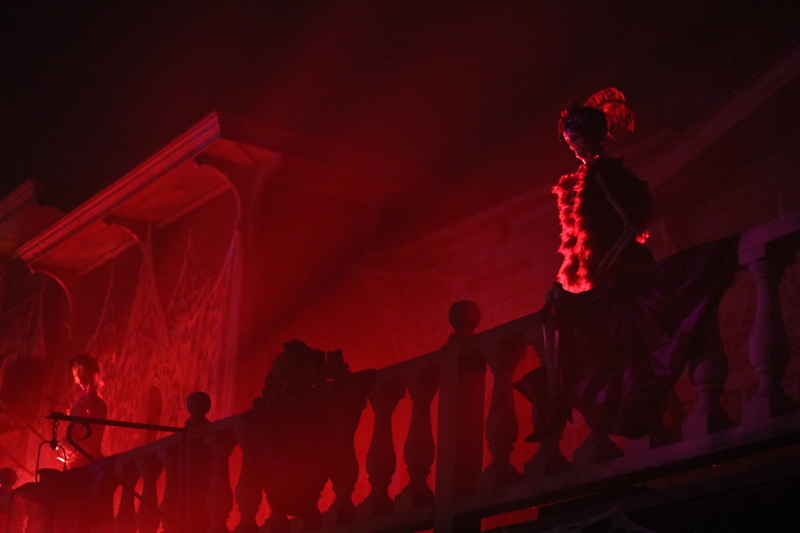 The wonderful Men and Women who call Carnevil home have brought it back to life for us. Now we cannot wait to walk down the Boardwalk again with each visit. This zone could have staying power for years to come. 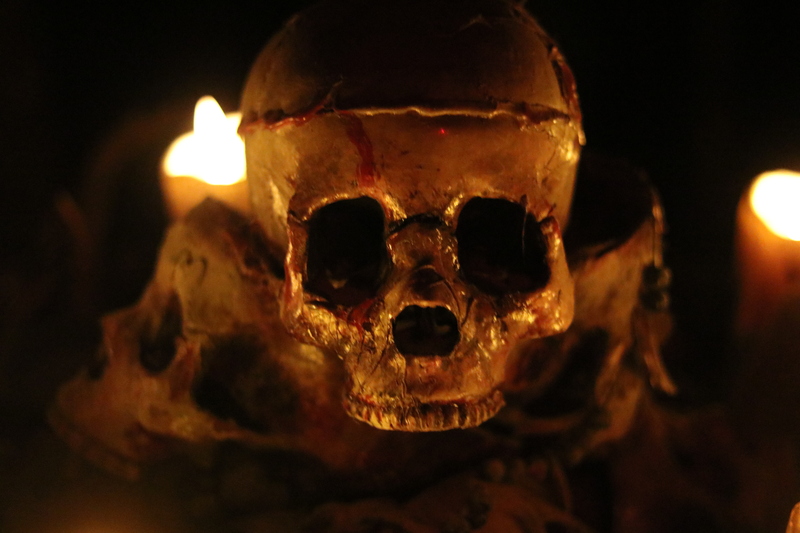 A standout addition from last years event, The Hollow returns even stronger than before. Last year, there seemed to be little lighting and a whole bunch of fog. Almost as much fog as Ghost Town! But this year, the designers seemed to have given the area a different lighting package. One that suits the area much better than its first year. On top of those lighting additions, we felt like the zone was adorned with much more decorations than last year. 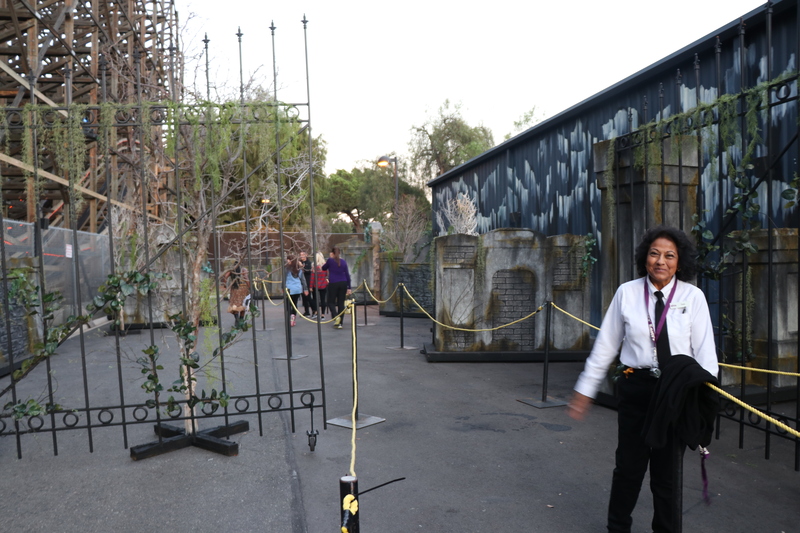 The decor really helps to set the tone and feel of the scare zone, in turn making the whole area more effective. On top of that, we felt like it had many more monsters this year. Or if it was the same, those monsters worked it hard to make it feel more populated. Regardless, we commend these monsters because of their high energy and scares. 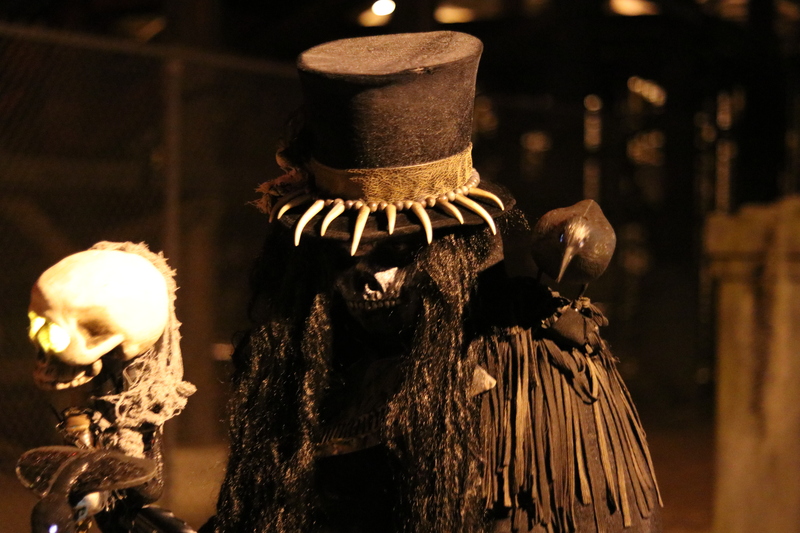 Camp Snoopy is the perfect location for a scare zone and these monsters use every inch of the location to their advantage. 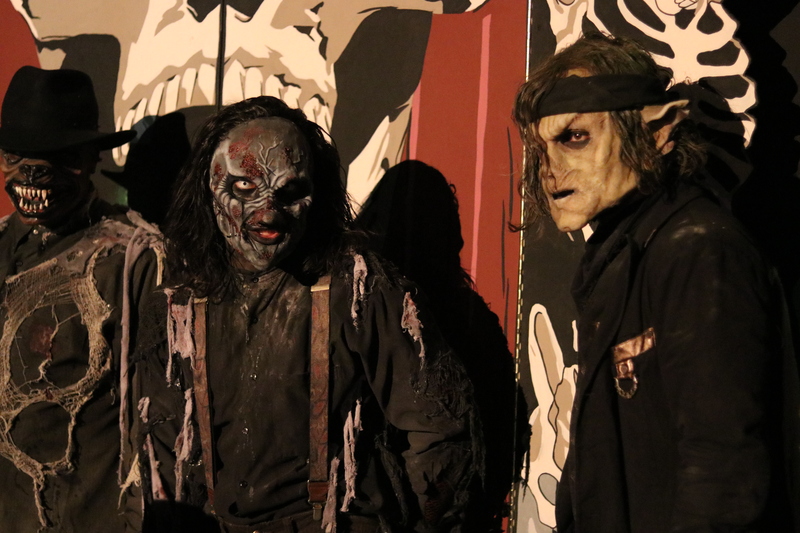 If there was any complaint about this years scare zones, is that there seemed to be a safe zone. 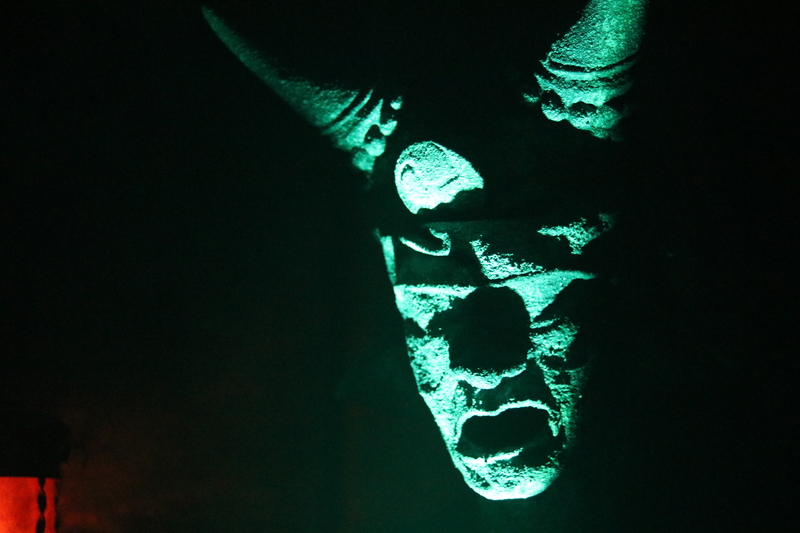 In years past, monsters were allowed to roam in any and all areas of the park, within reason. 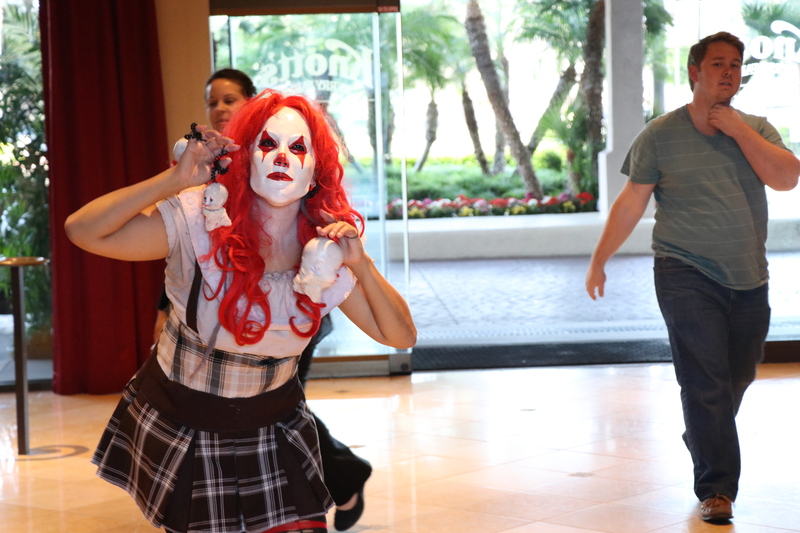 But this year, it seems like Clowns were not allowed to enter the space near the Elvira Show. We are unsure why this rule is in place, but would love to see it taken away. 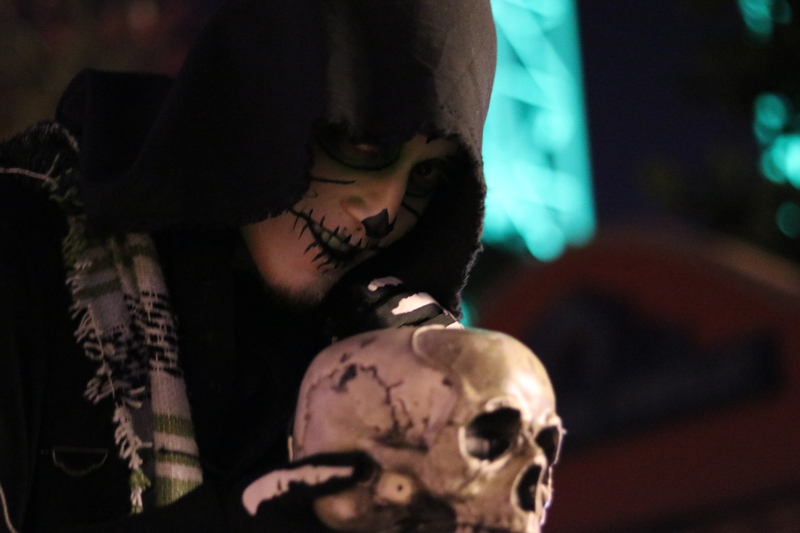 This year was an astounding success for scare zones. Fixing problems from previous years while still maintaining the feel and scares they have held before. 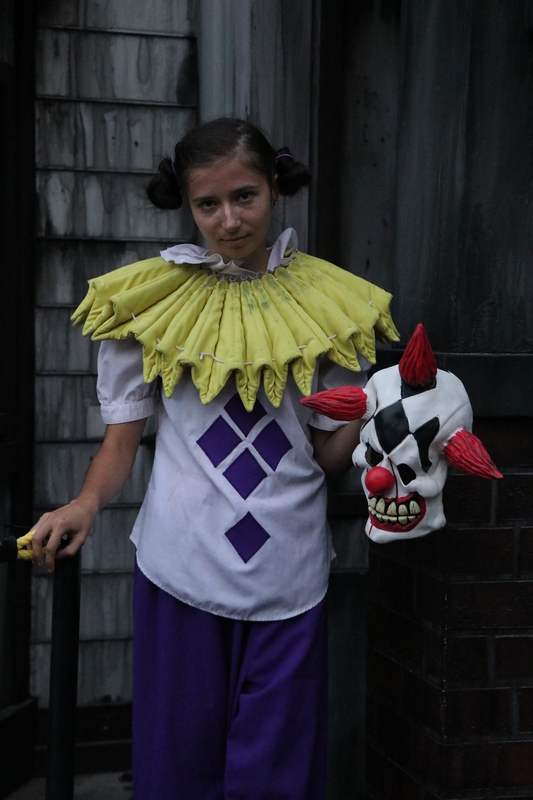 Or in the case of Carnevil, improved their scare zone even in a less than perfect situation with construction. Back once again, Voodoo returns with a much different approach. Instead of entering the attraction from the facade, you enter where we would previously exit. We can be honest and say when we heard that announced, we were less than excited. It seemed like a lazy way of actually overhauling or changing a maze. 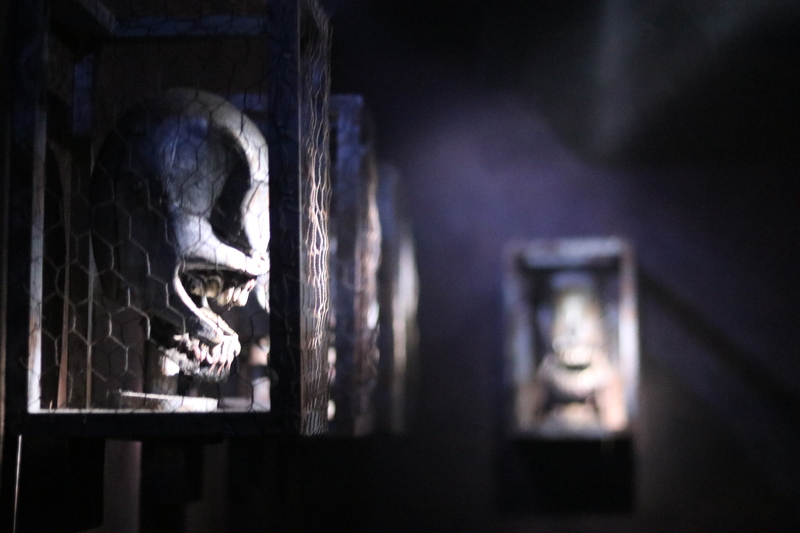 While flipping the maze around did breathe a certain amount of new life into the attraction, we are unsure if it was enough. Maybe if a slightly new story line had come with it. 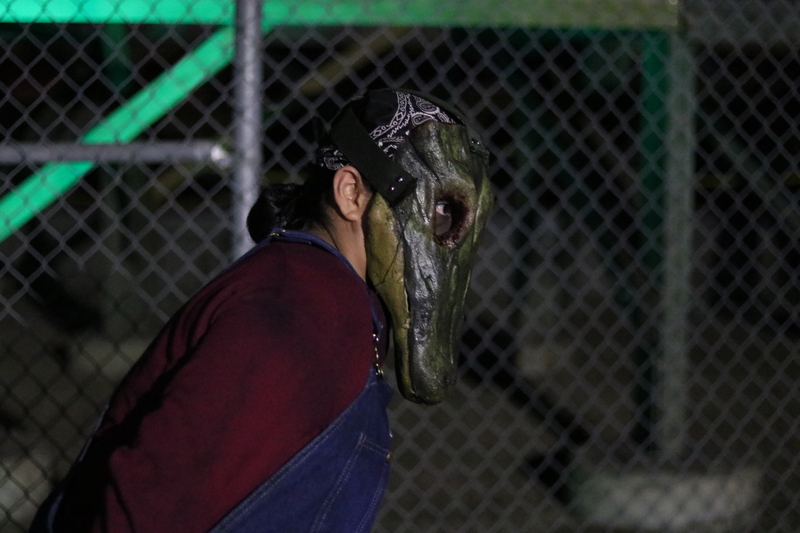 The swamp area was not quite as effective in reverse, although we did enjoy the second half of the maze. The ending was re-tooled to work with the reverse layout. They even moved the giant snake to a new location! Snake pictured below. 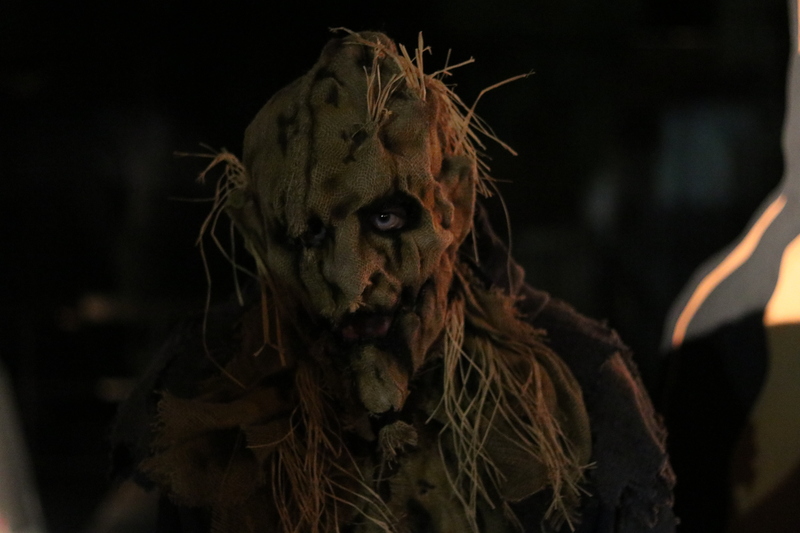 Before going to Scary Farm, I was ready for the attraction to sink into the swamps once and for all. Flipping the maze on it’s head gave it one more year, but we are not sure if it has another. 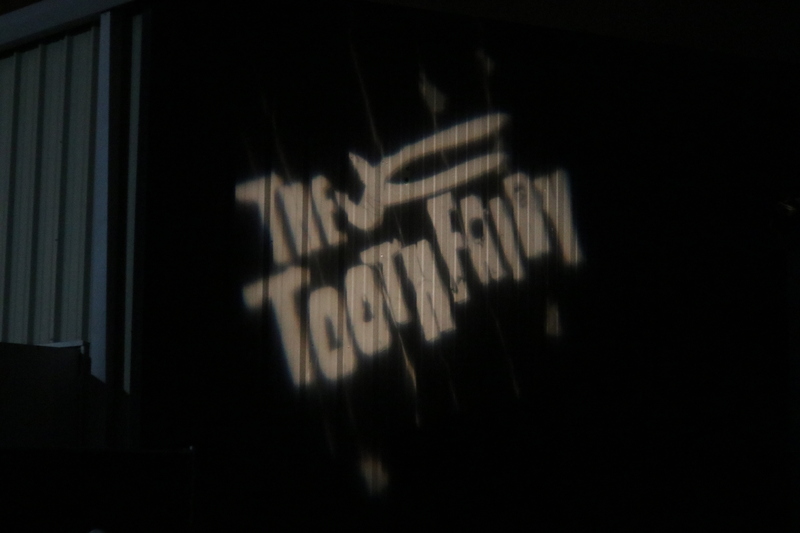 This twisted tooth fairy steals more than just baby teeth as he drags his victims out their bedroom window and into a world of deranged dentistry. 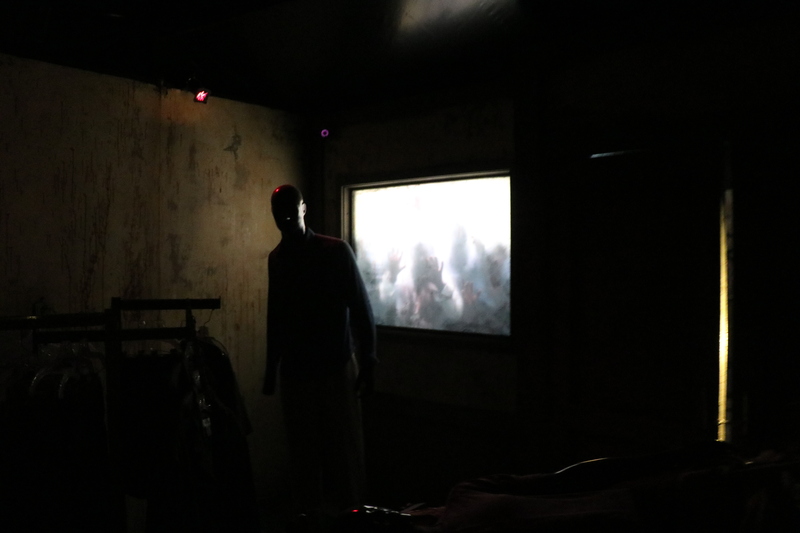 Unbelievable special effects include a blackout room through which guests must feel their way out, a disorienting x-ray strobe light room, and a finale with new terrifying surprises. Say aahhh. Since it’s first year, The Toothfairy had always been a must hit for me. 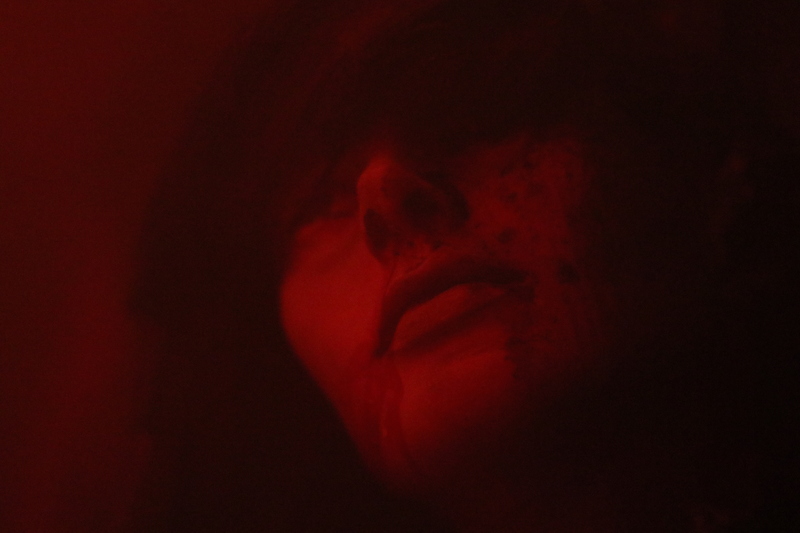 It’s mixture of gore, storytelling and scares always enticed me. Over the years it has gone through changes for the good. This year, one of the major changes is the ending of the attraction. They have made it much more claustrophobic and scary than any year in the past. But it did not lead up to anything. 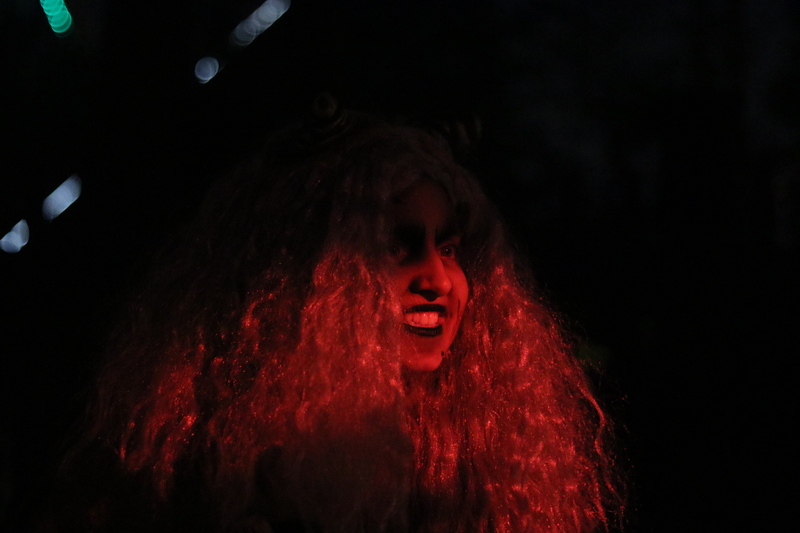 They replaced the previous animatronic/puppet Toothfairy with a live person. This sounded phenomenal because we will always choose an actor over anything else. Simply because it is much scarier than anything else you can use. But for some reason, this just didn’t work for us. 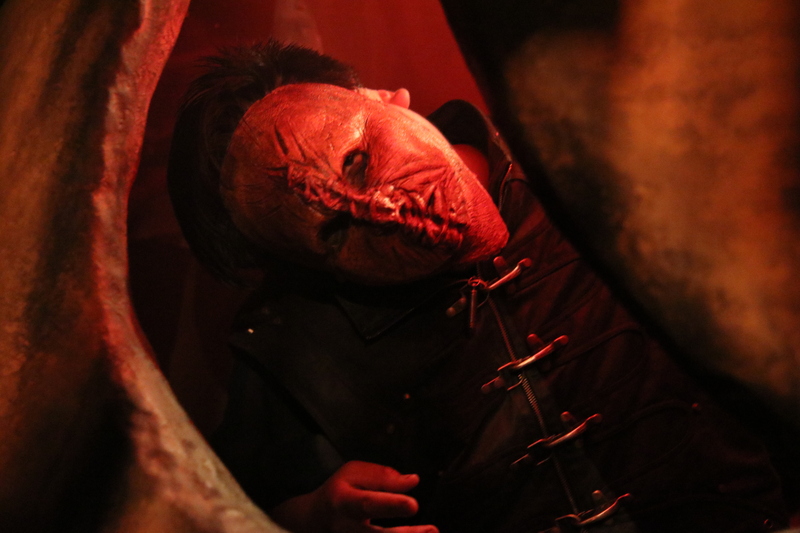 Although we didn’t like the new punchline ending, we still feel that the maze is still as strong as it has in the past. But if I were to choose a maze to go, I think The Toothfairy has run its course. The smash hit maze that hit the scene two years ago returns! This is the only case where I would never want them to drastically change the maze in the future. Yes updating and chaining mazes is necessary, but the major design for the attraction is perfect in our opinion. 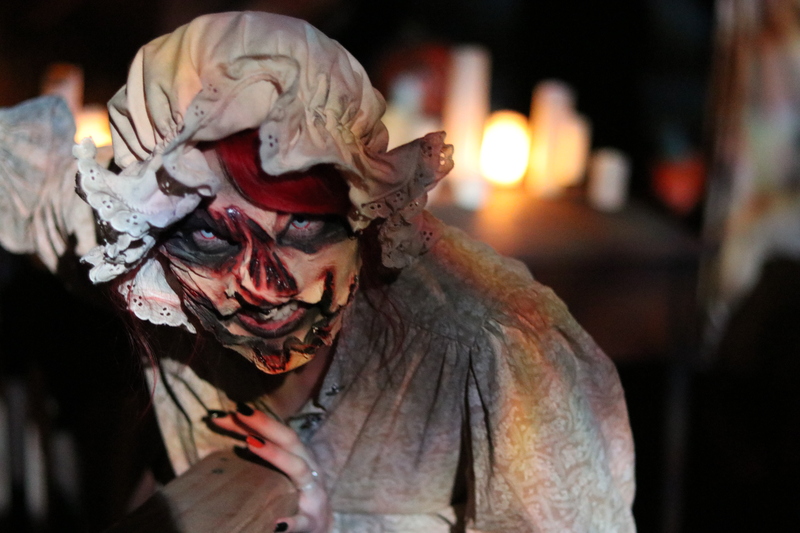 Plenty of places to hide for scare actors that make the scares feel unpredictable and plentiful. This moment with the actress still make people’s jaws drop. Overall, this maze is still so scary in so many ways. It is also just so beautiful. For us, this is always a must hit maze. 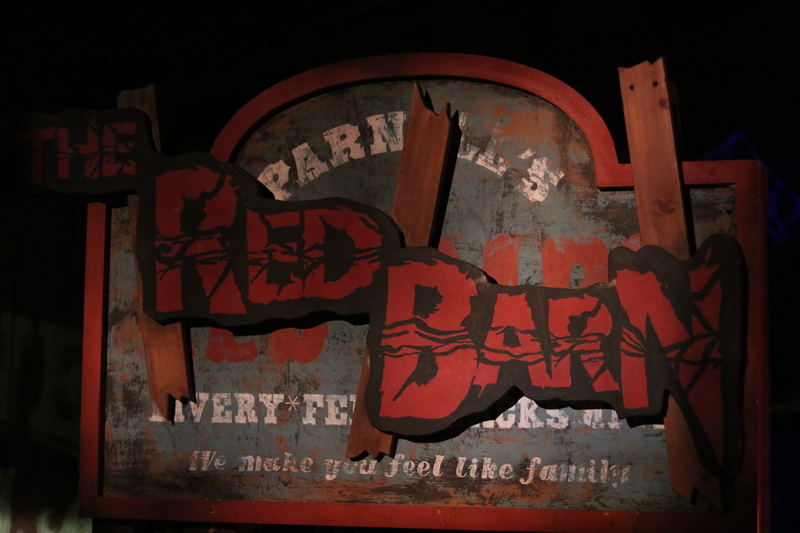 When The Red Barn hit the scene last year, it is no secret that we were not a fan of it. 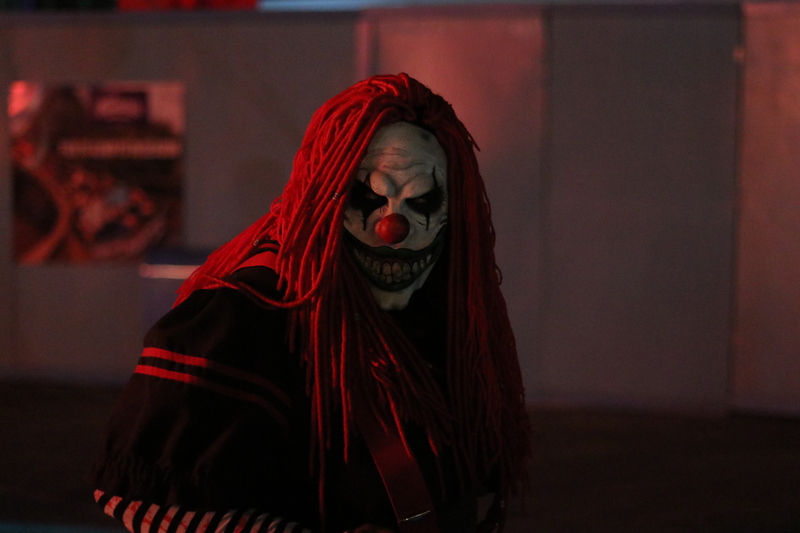 Leaving Scary Farm 2016, we were really hoping they would change things up and address the issues. Luckily our prayers were answered and the maze has improved so much! 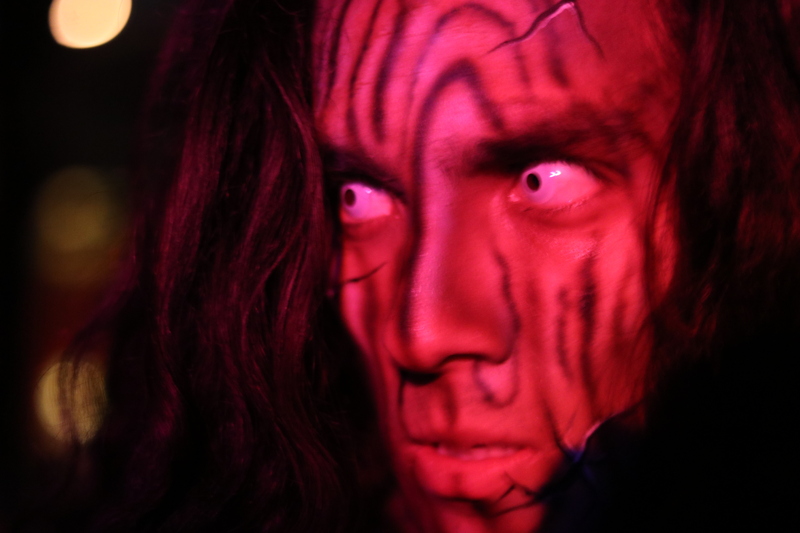 The distinct use of pulsing people through the maze worked well for us! Smaller groups meant more scares for everyone. 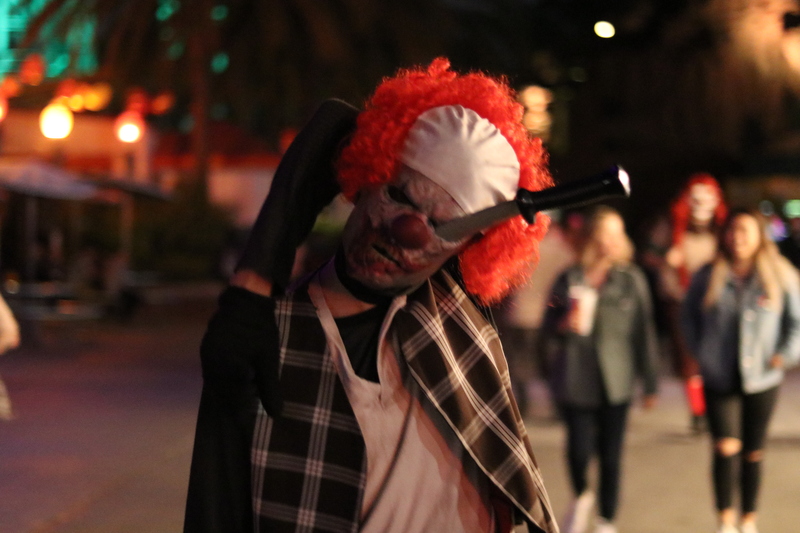 I did notice that many of the spots that were used for scares last year were not used this year. That proves to me that they really did look over the entire maze to make it feel different. One noticeable difference is the character looming over you as you enter the attraction. With a microphone in his hand, he basically tells us we are going to die and that we should RUN! 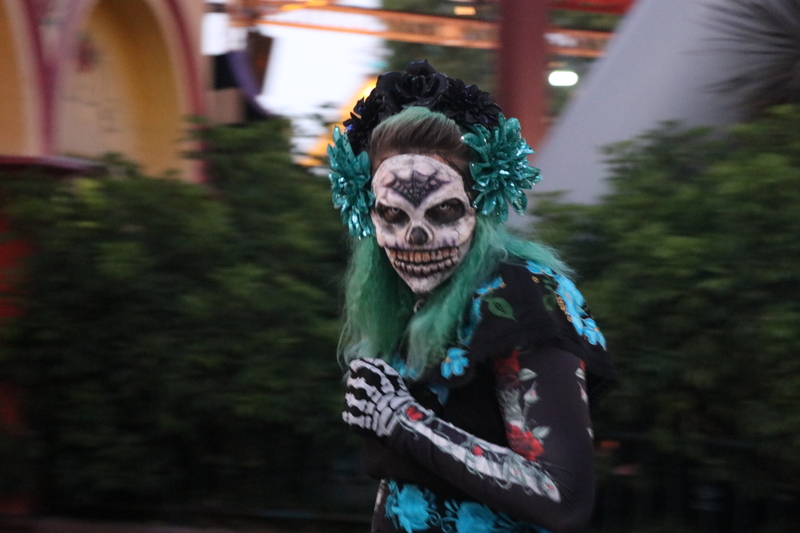 This sets the tone for the rest of the attraction and gets your heart racing. The intensity of this maze has increased significantly than last year! 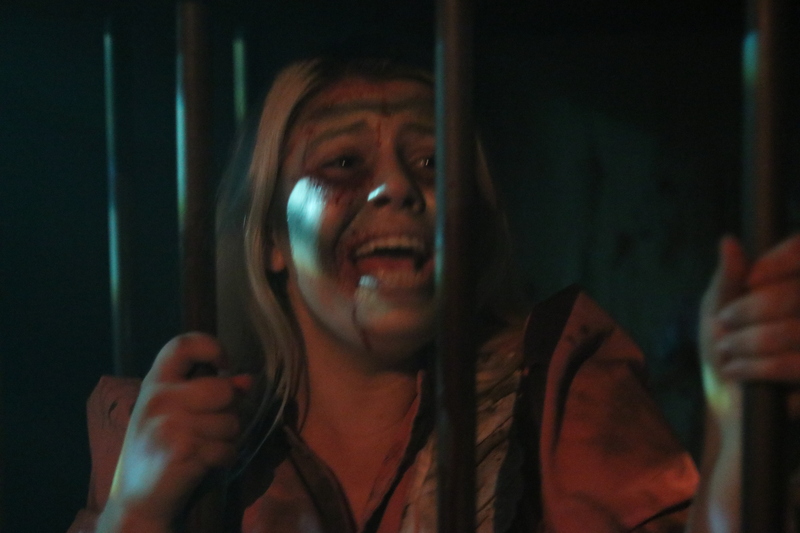 It helped because Knott’s has used women who were the victims of the Grey Man telling us how to escape his wrath. 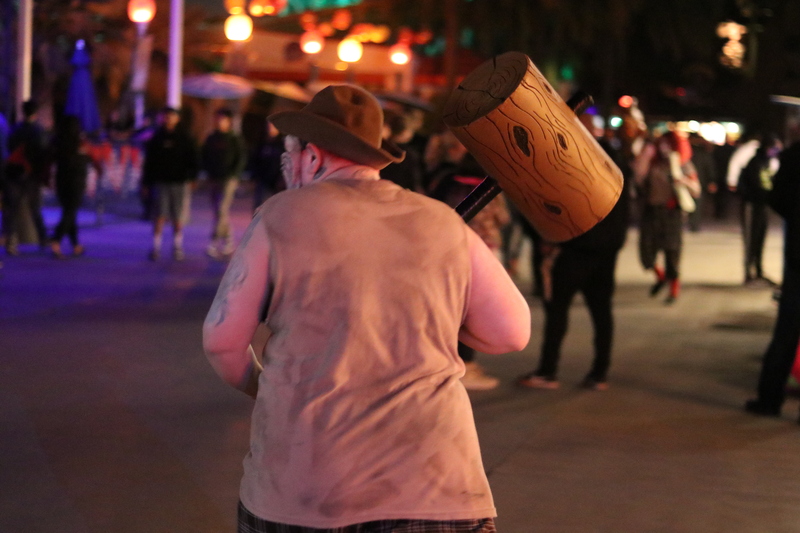 And above all, they had REAL CHAINSAWS! This made us smile and scream all at the same time. We were both so happy with the progress that was made on The Red Barn for 2017. 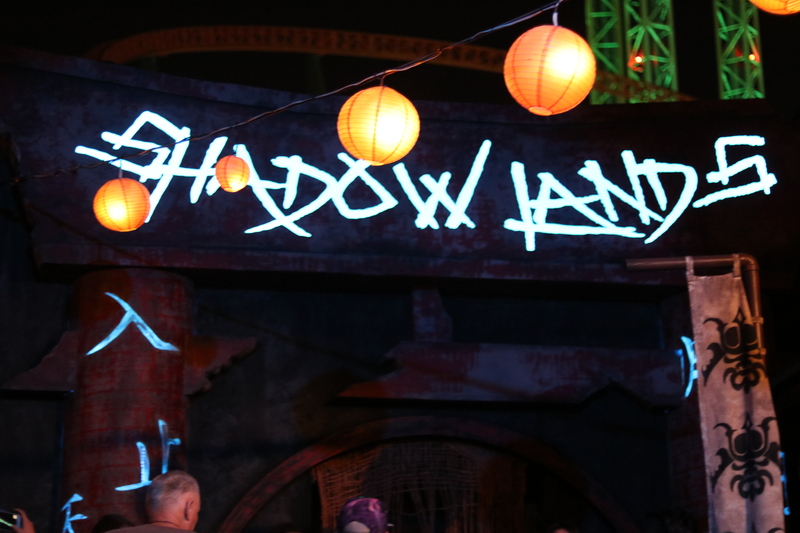 Shadowlands was a big hit when it debuted last year at Knott’s Scary Farm. 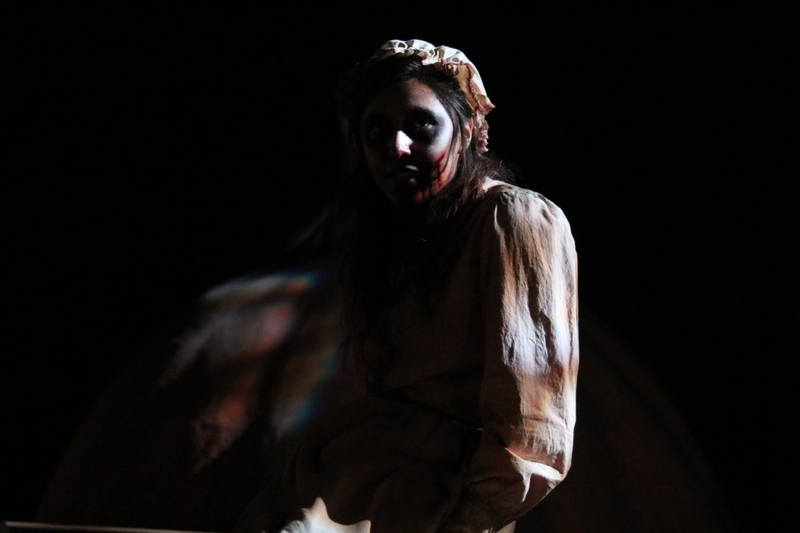 I am happy to say that it continues to be scary as hell! 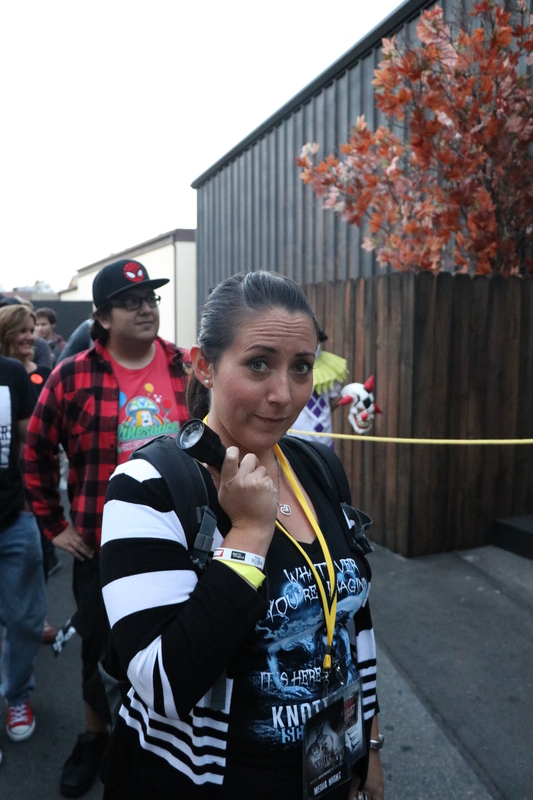 The night we were at The Farm, this line was massive. People seemed to remember it from last year and were excited to experience it again. There were some minor changes made to the layout of the attraction, one major noticeable one is the show room. There are two of them this year to help alleviate the wait people have in line. This maze continues to run on all cylinders from last year. 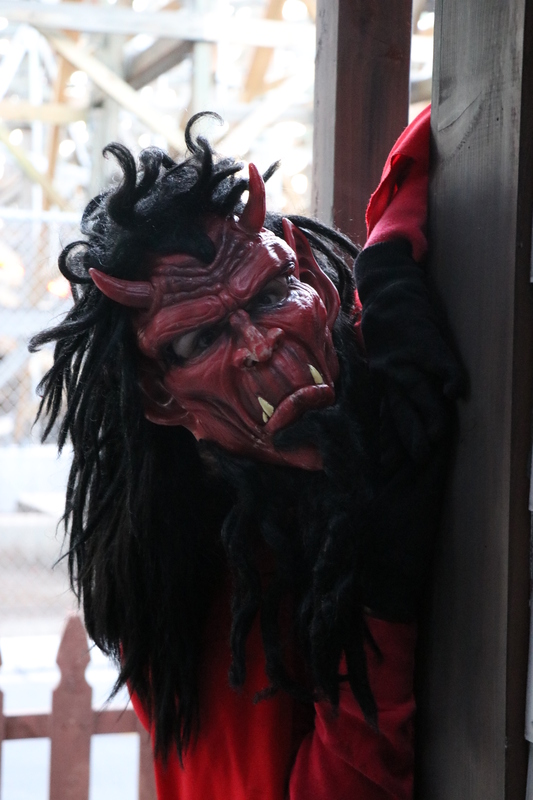 The scares are extremely effective from room to room and it is just so much fun. Infected returns! A major fan favorite for those who want to live in a video game. If you have not been in Infected before, you are given a gun and told to shoot all the zombies, but HEAD SHOTS ONLY! It is an incredibly fun maze and very intense. You are constantly moving and trying to focus on making your score go up which makes you very susceptible to scares. The tight corners and corridors make it so much more intense than it used to be in the past when it was in Camp Snoopy. This attraction gets lines that stretch well past Pony Express and sometimes past the train tracks. 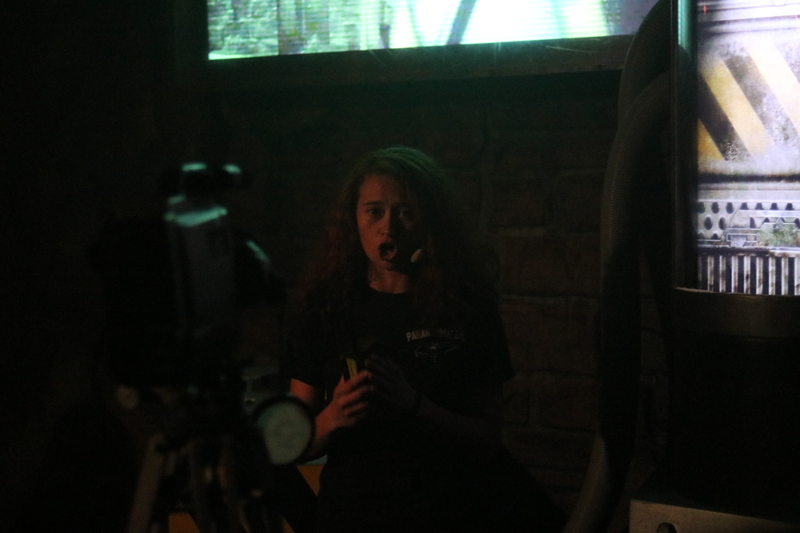 If this is something you really want to do, make sure you head to the back of the park to experience Infected first! You will not regret it…unless you get bitten by the infected. 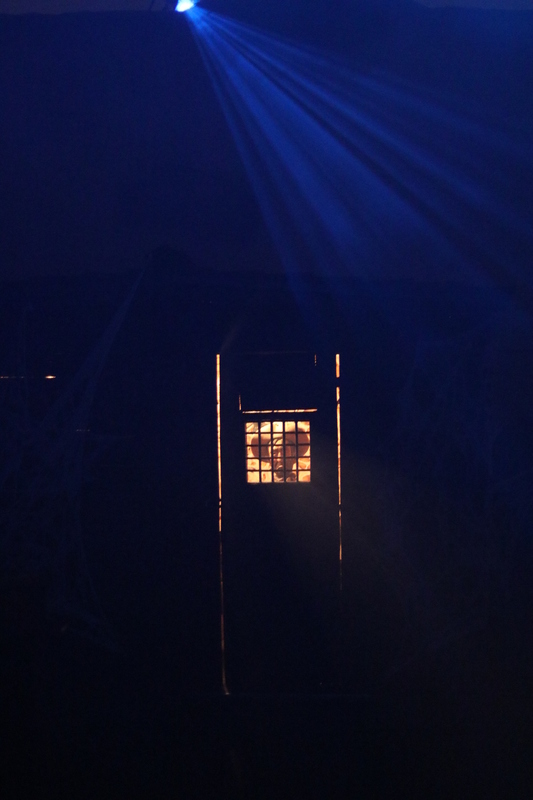 Armed with only a faulty flashlight, explore the creepy house at the end of the street, in the upgraded Trick-or-Treat: Lights Out maze. 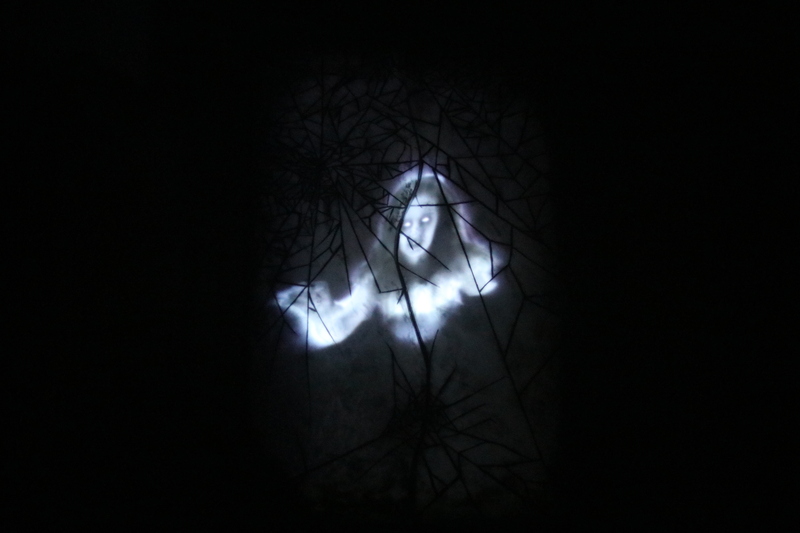 Face the terrors of the house in complete darkness as your interactive flashlight reveals the horrors hiding in the shadows. 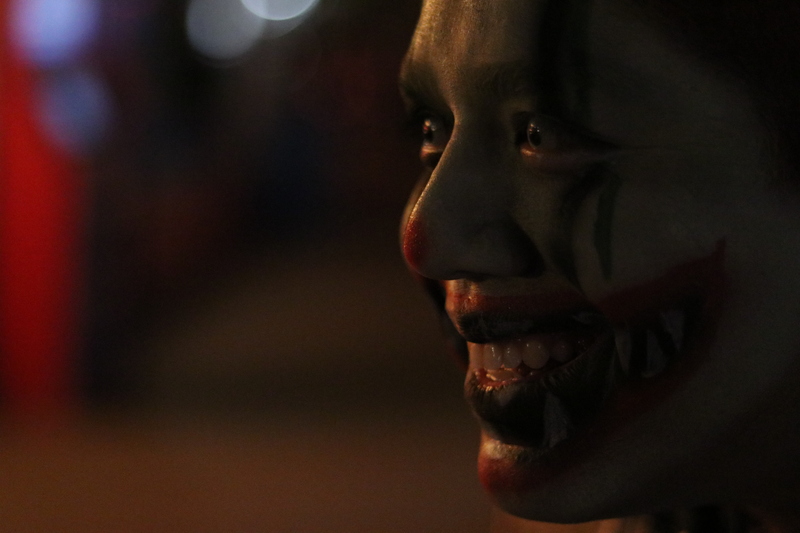 Featuring new state-of-the-art effects, unexpected scares and other eerie surprises, Trick-or-Treat: Lights Out will terrorize you like never before. 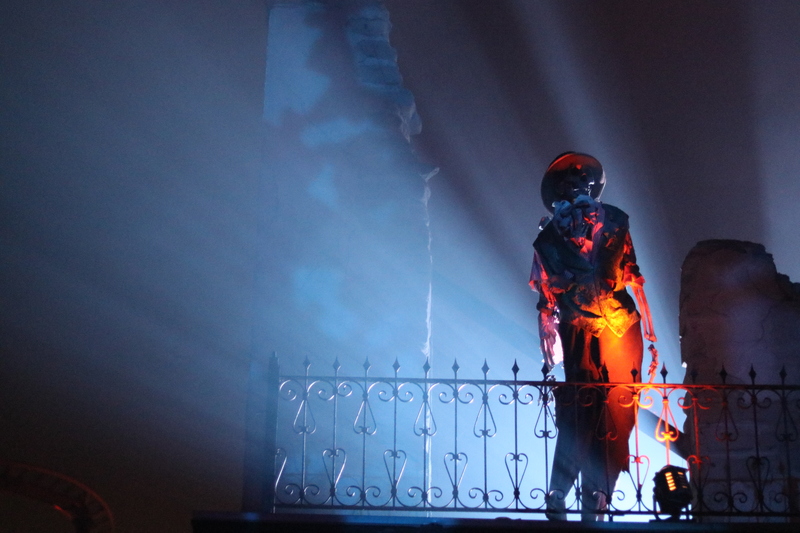 Trick or Treat: Lights Out is the perfect example of how to refresh an older attraction that may be getting a little long in the tooth. The team took the original style for the attraction and changed it to a much more realistic style. 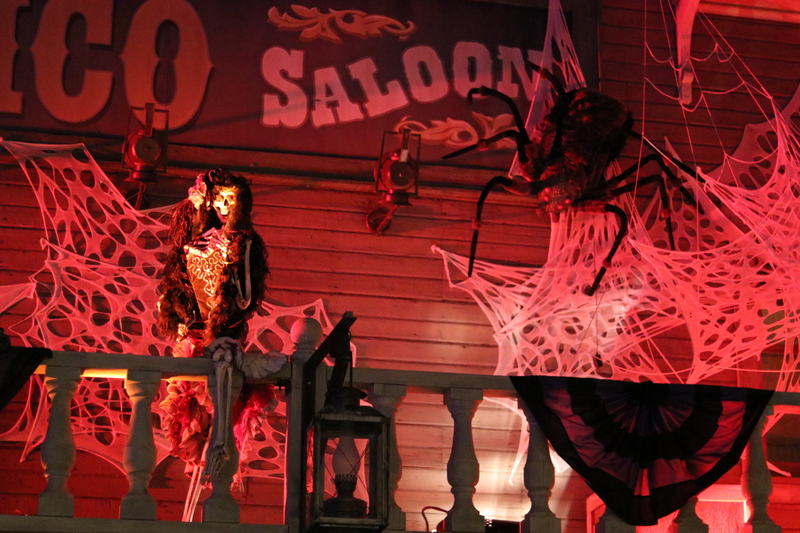 The facade for the attraction is a major example of the difference in tone for this year. As you approach the facade, the music is so different! It is reminiscent of Stranger Things and Halloween. 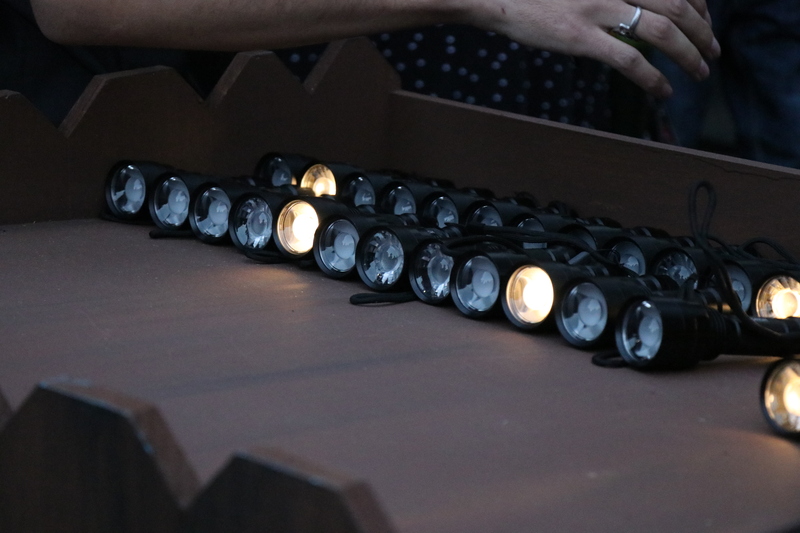 Once you get over to the entrance, you and everyone are handed flashlights to use inside. Once inside, it feels very familiar, just much darker. 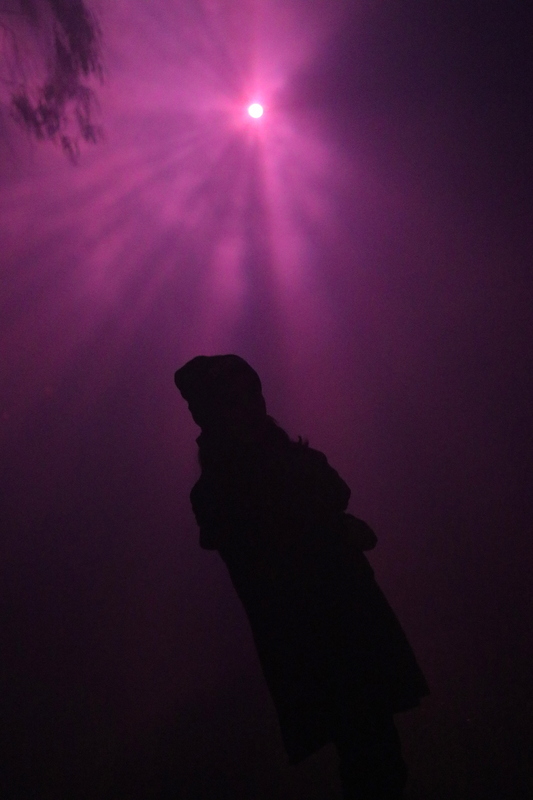 You have to use your flash light to illuminate your way and whatever might be lurking in the darkness…. I do wish the first two rooms had some more actors. But just because there aren’t that many in the front doesn’t mean there aren’t enough scares to go around. Once you get a bit further into the attraction, that is when things start to change. You go outside the house and inside a green house which had some wonderful set and sound design. Also got a really bad scare there as well. 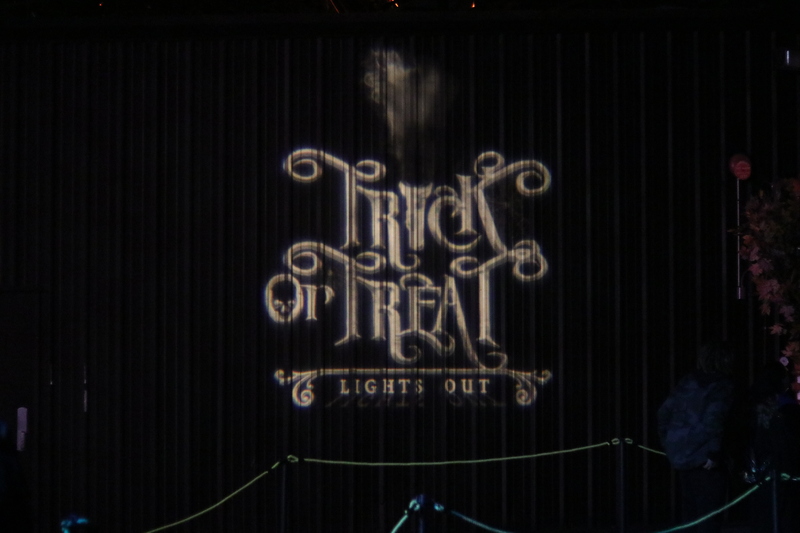 Overall, is Trick or Treat: Lights Out so drastically different than the original Trick or Treat? No it’s not, but it keeps the familiar and popular portions while still upgrading and changing it at the same time. The changes and additions that did happen makes this feel refreshed and new for 2017. 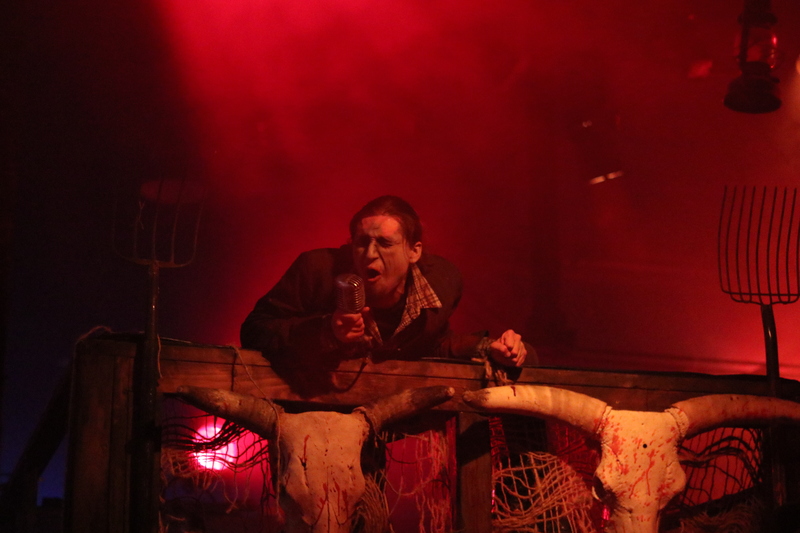 BRAND NEW FOR 2017, Pumpkin Eater comes from the twisted mind of Daniel Miller and brings to life the Peter Peter Pumpkin Eater rhyme that we all know from our childhood. 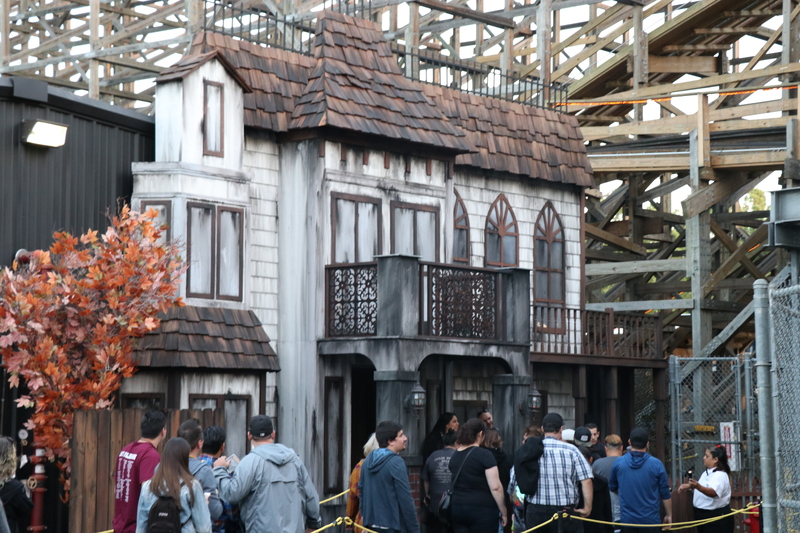 This is singlehandedly my(Gabe’s) favorite maze at Knott’s Scary Farm 2017! 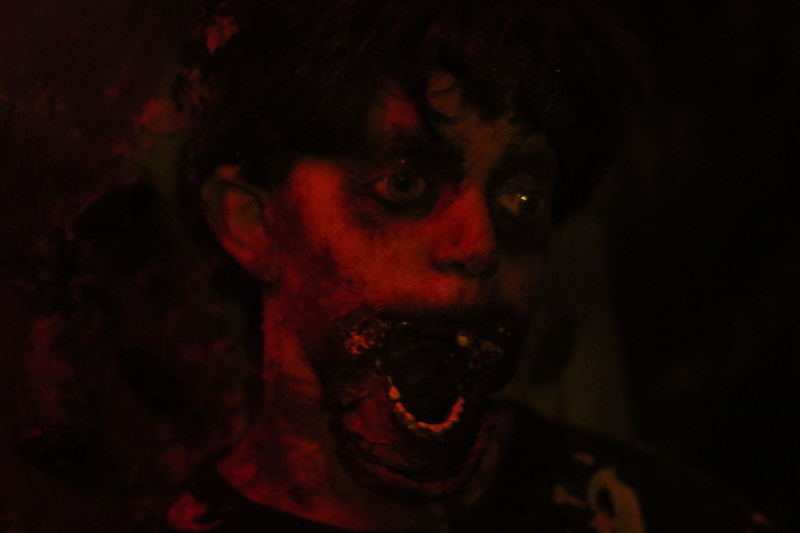 It is the perfect mix of scary, spooky, disgusting, gory, and fun! Plenty of portions made me cringe in disgust so many times because of how visceral it all is. 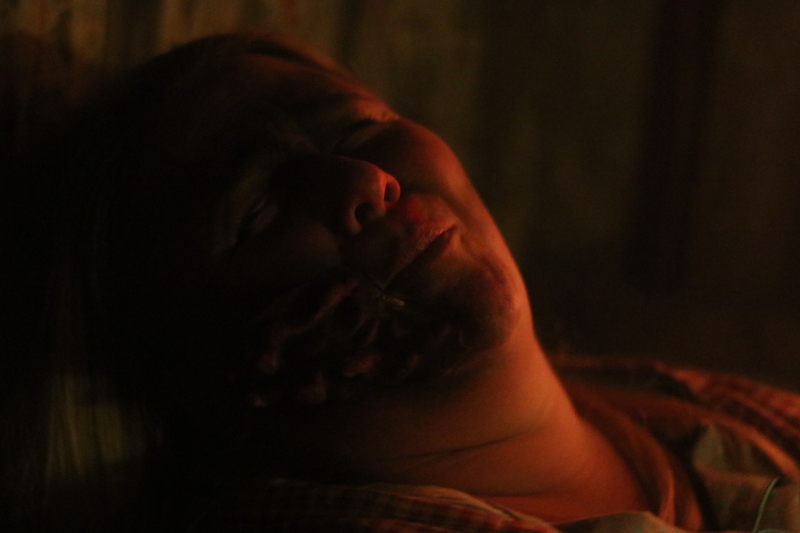 on top of the maze design, sound design and lighting; the prosthetic work in this maze was down right disturbing and awesome! 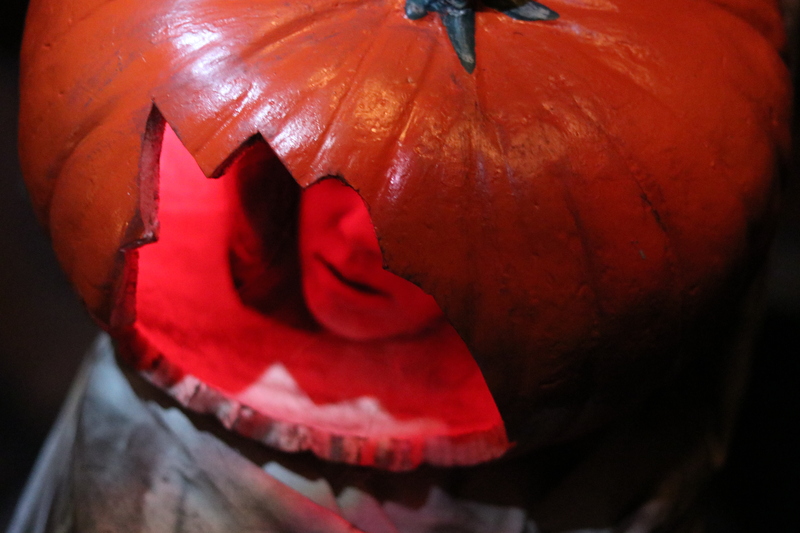 Women were running around with their faces carved like pumpkins letting us know that we would be made pretty too. Comments that just send chills down your spines. 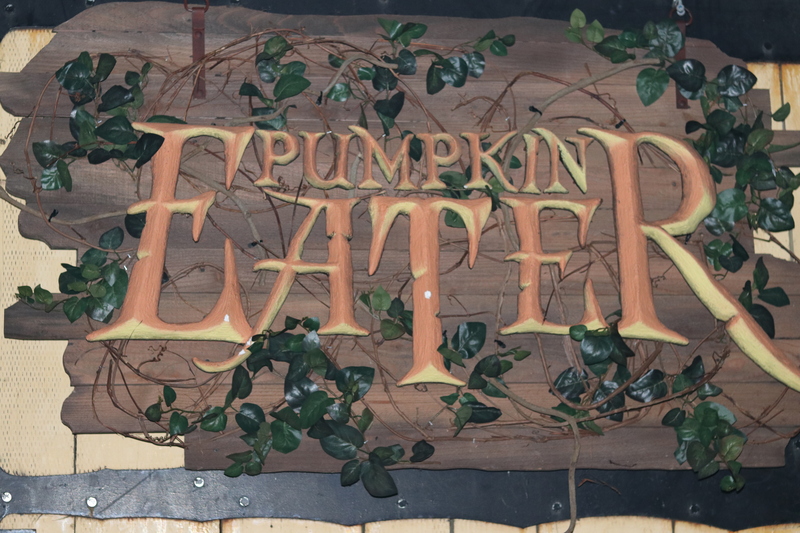 I highly suggest you check out this attraction when you go to Scary Farm. 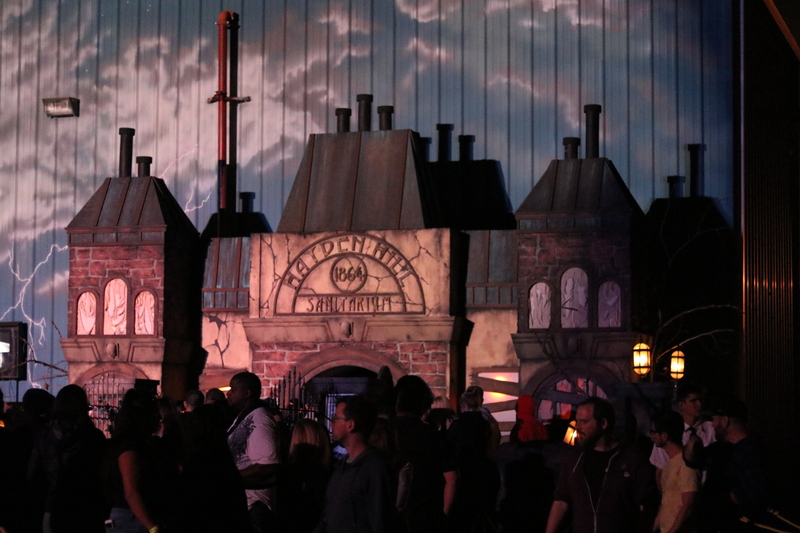 I do not remember another maze at Scary Farm that has had the hype that Dark Ride had when it was announced. It was the topic that everyone was talking about. Other than feeling excited to go through the maze, people were just so curious how they would pull something of this caliber off! 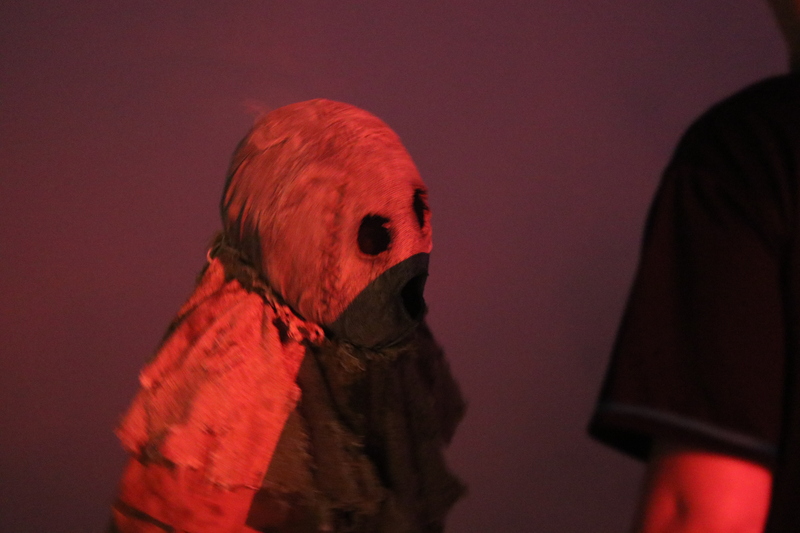 It seemed so complicated and something so different than we have seen in any haunt event. For us, it was either going to be a home run or a complete strike out. 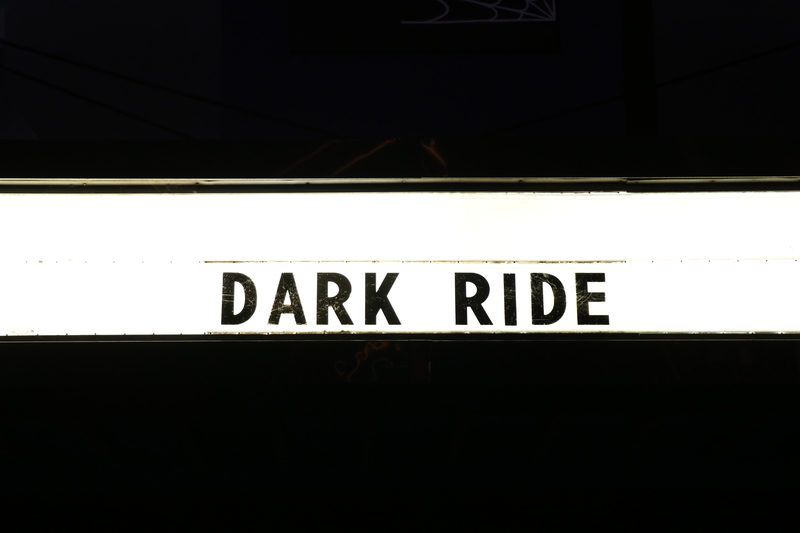 I am happy to say that Dark Ride is a home run! 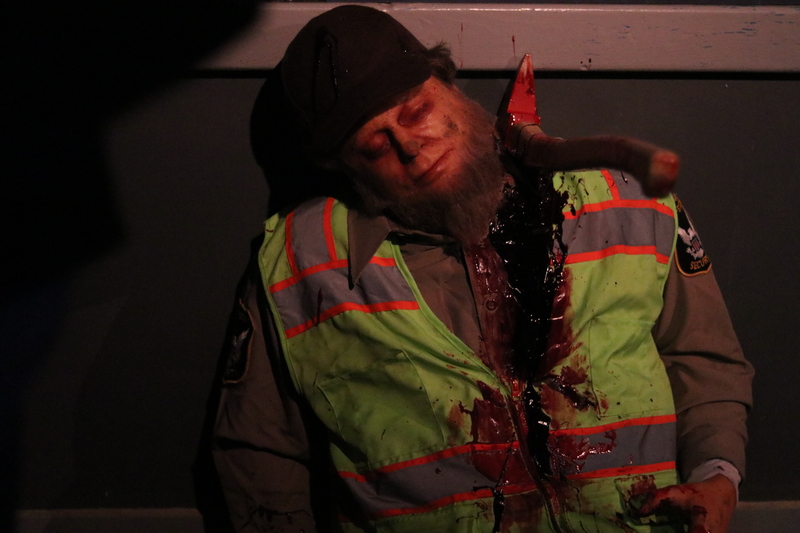 It perfectly rides the line of cheesy humor with amazing scares. 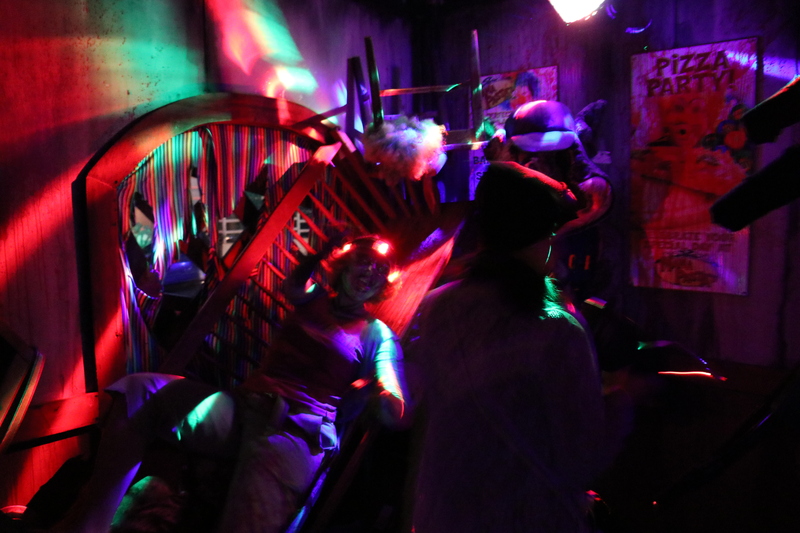 Each room gives you more and more of a glimpse into the twisted happenings in this broken down dark ride. When looking at Dark Ride from a distance, it seems very simplistic, but it is so complicated and it all works so well together. 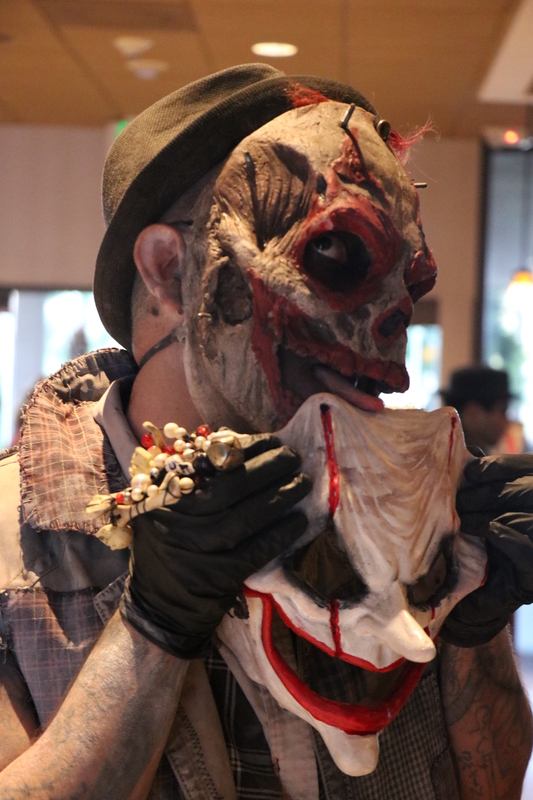 The combination of quality mazes and scare zones at Knott’s Scary Farm are what sets the event apart from any other Southern California haunt. 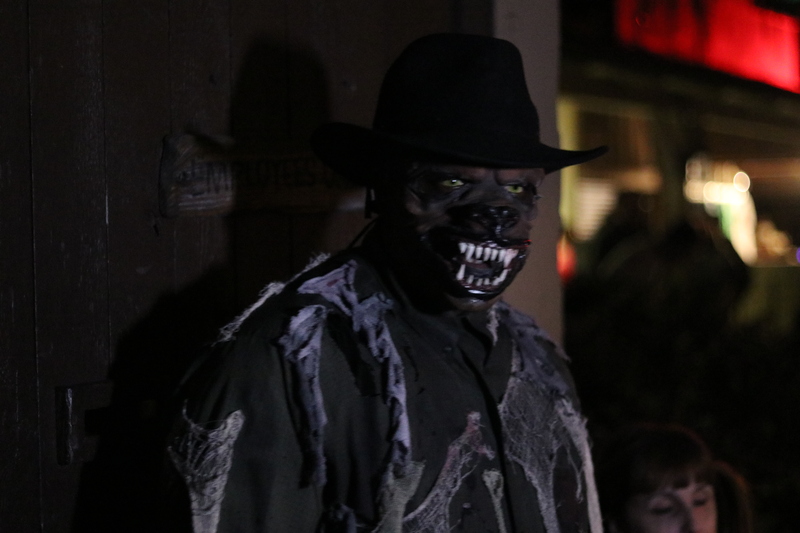 Knott’s has been doing this type of event longer than anyone else and it truly shows this year. 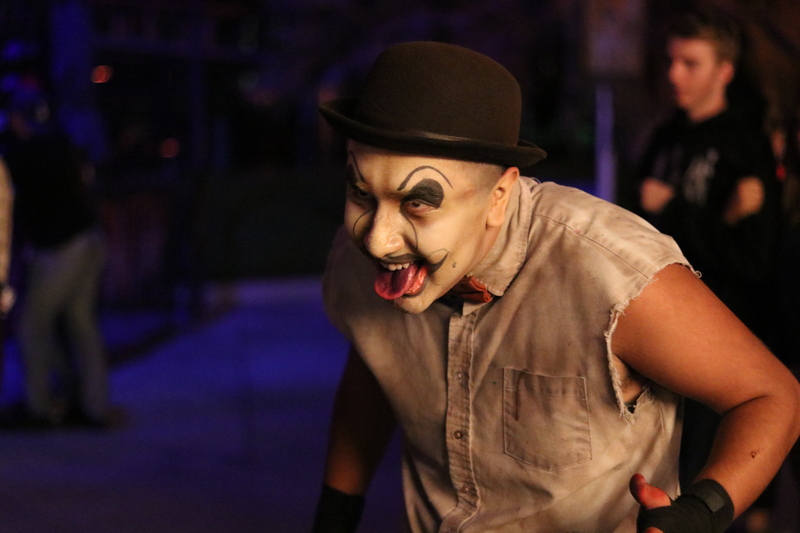 In it’s strongest year in recent memory, Knott’s Scary Farm shows its personality and character with its distinctive offerings. 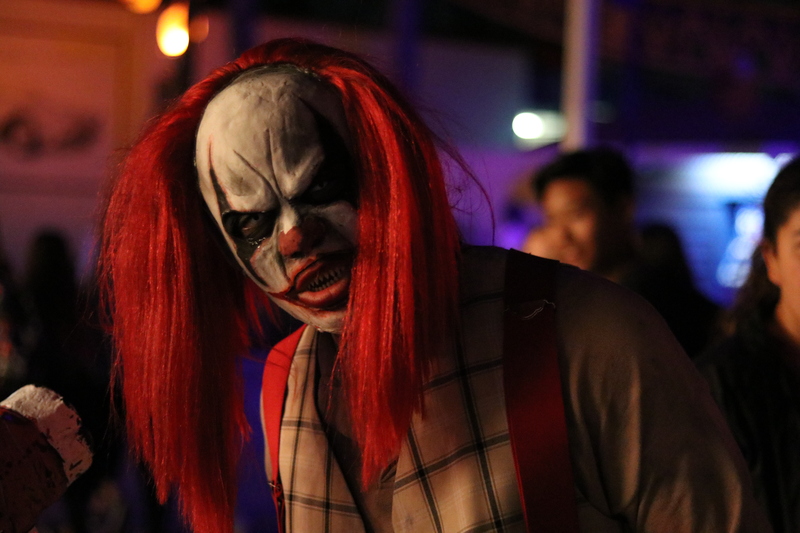 If you are on the fence on whether to go to Knott’s Scary Farm this year, pull the trigger and go!